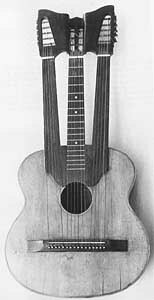 Additional Neck harp string attachment, Headstocks are a single-formed piece. 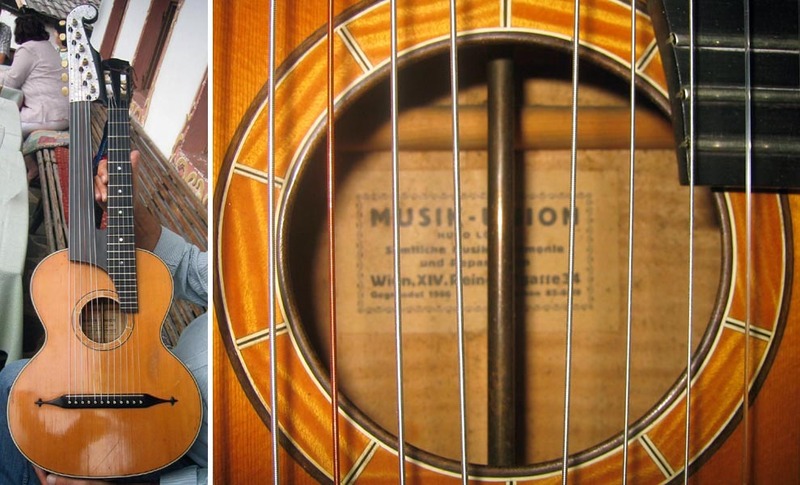 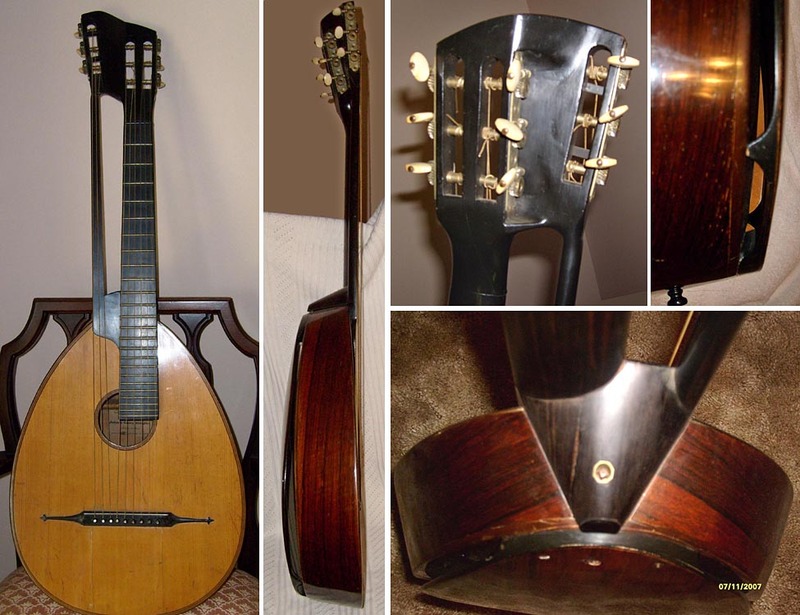 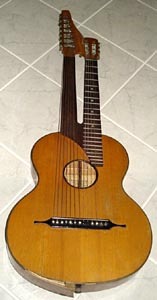 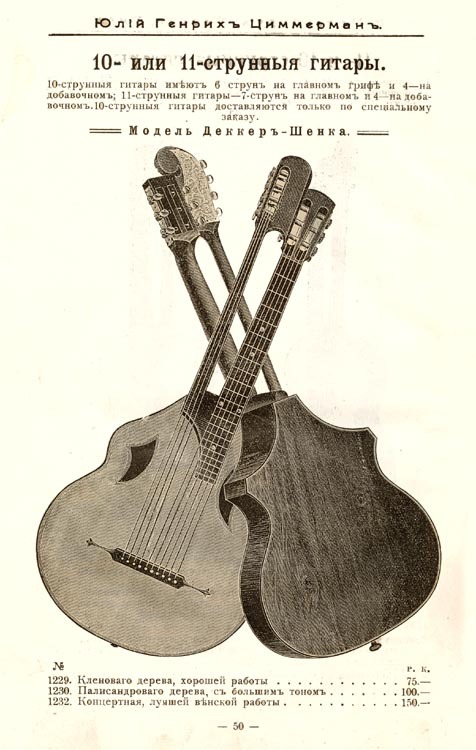 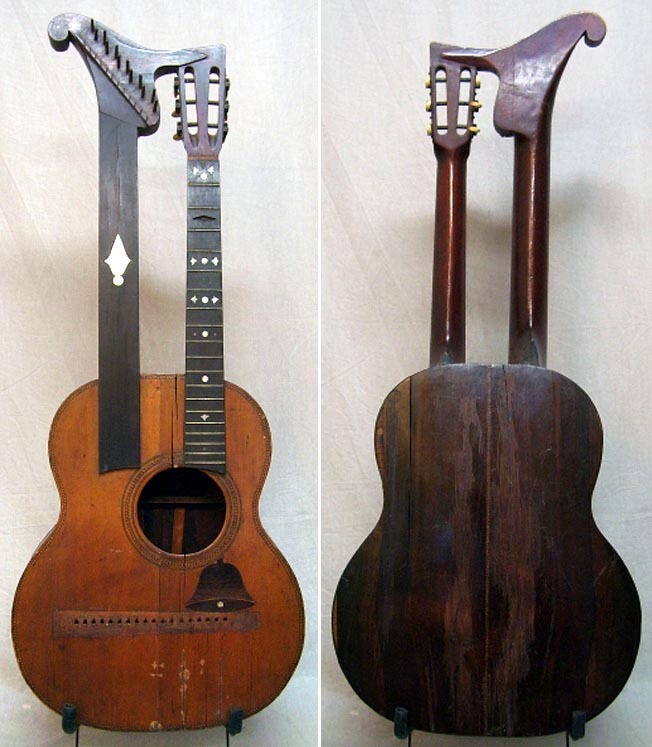 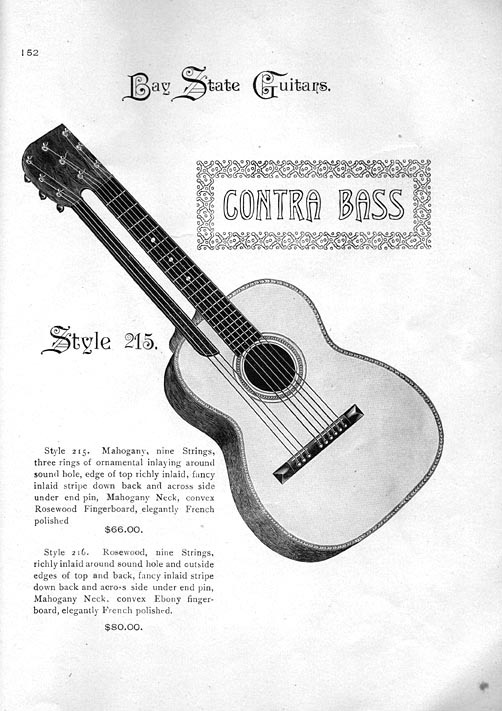 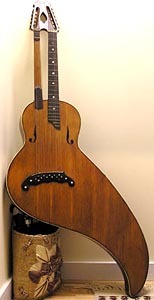 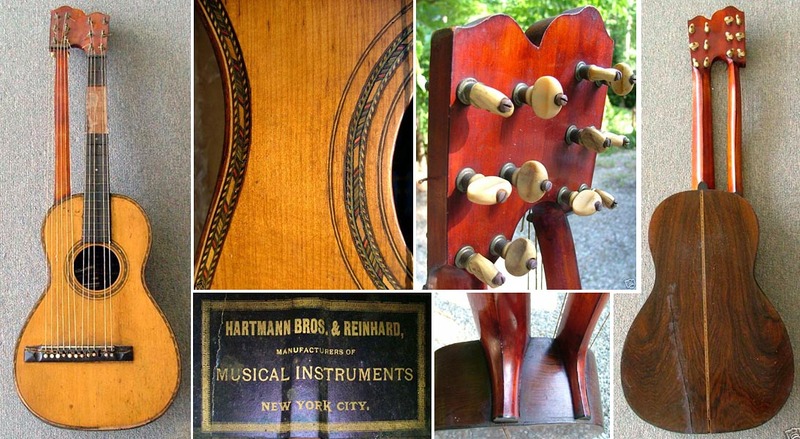 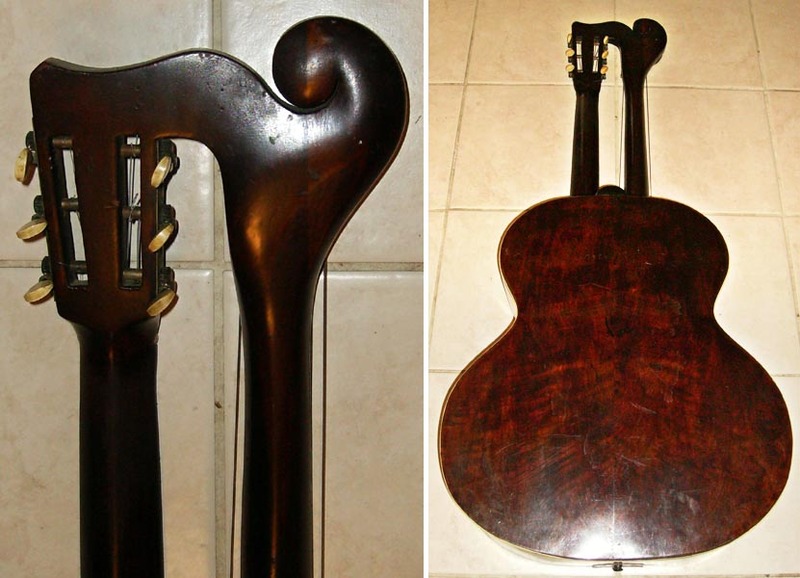 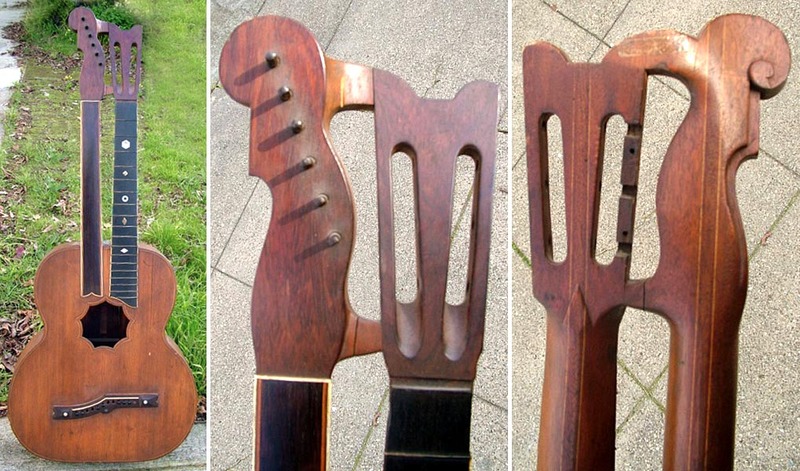 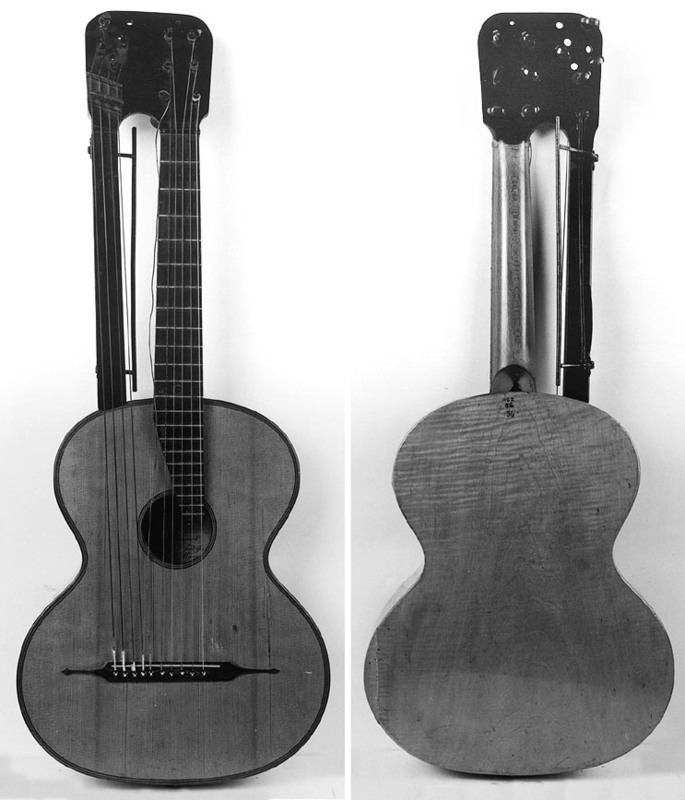 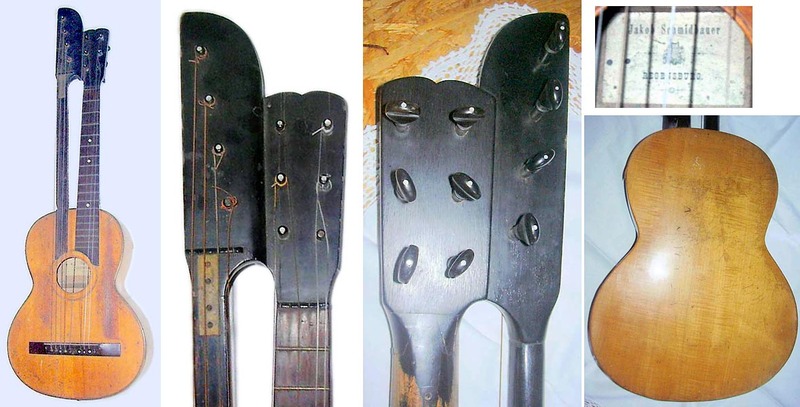 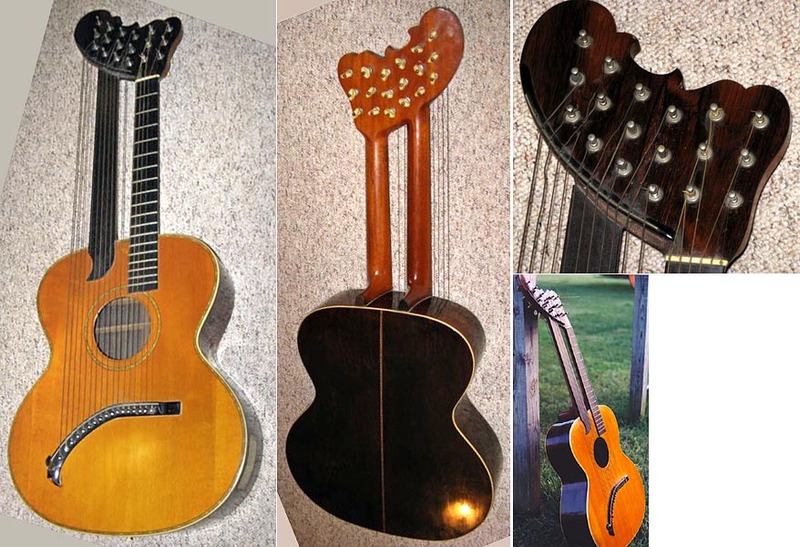 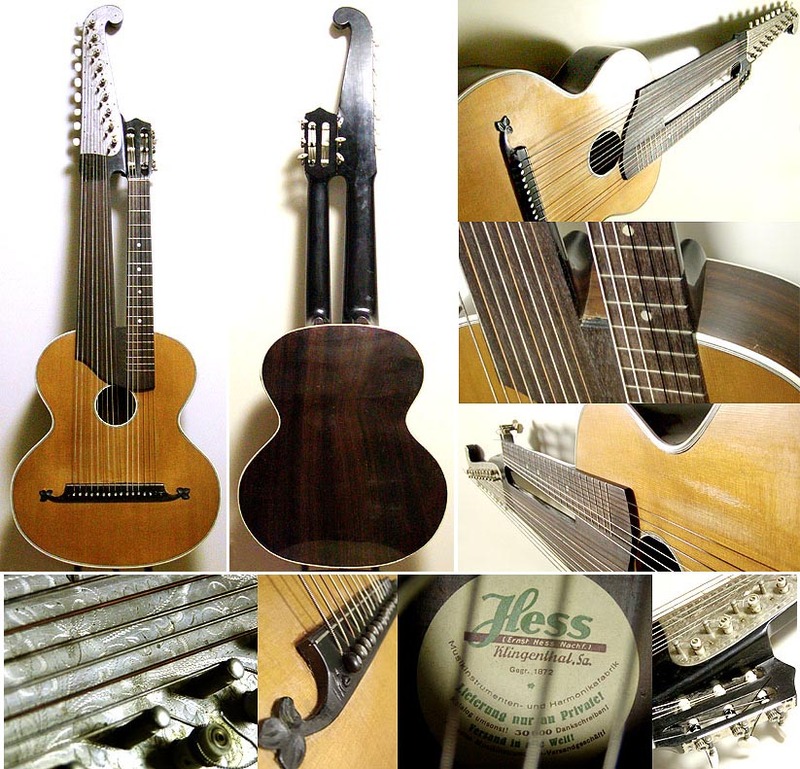 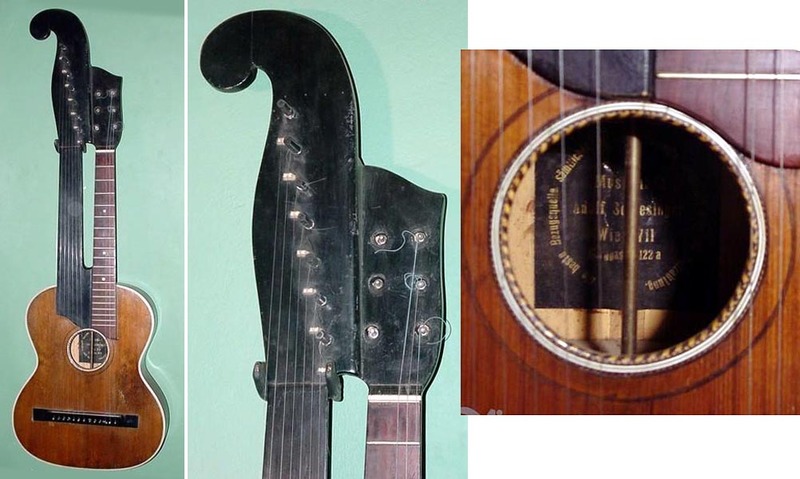 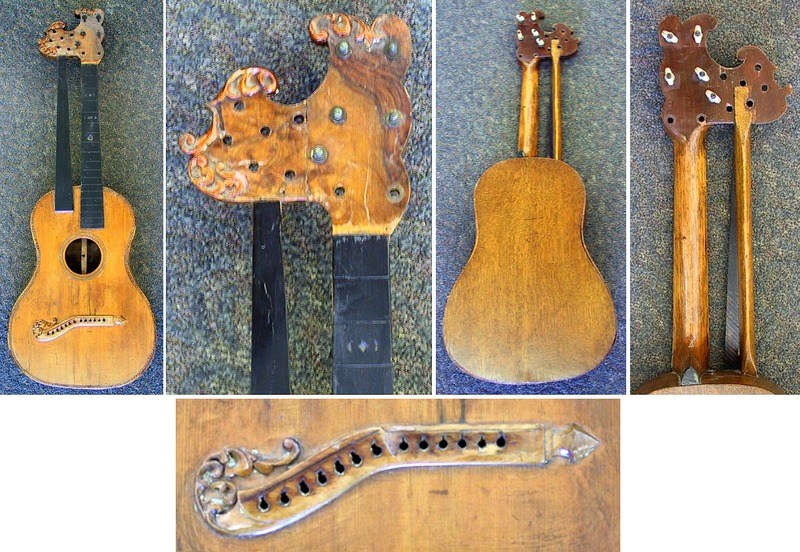 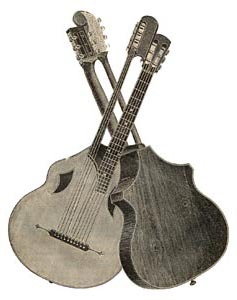 The appearance is not one of "joined" headstocks - instead, a single custom shape or structure connects the two necks. 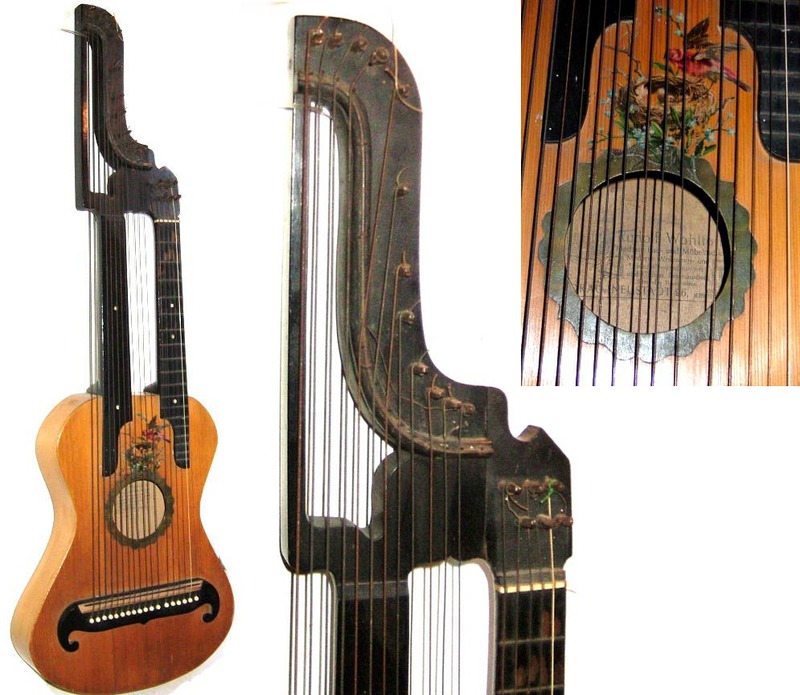 NOTE TO RESEARCHERS: Please understand that many of the instruments on this page were not originally referred to as "harp guitars." 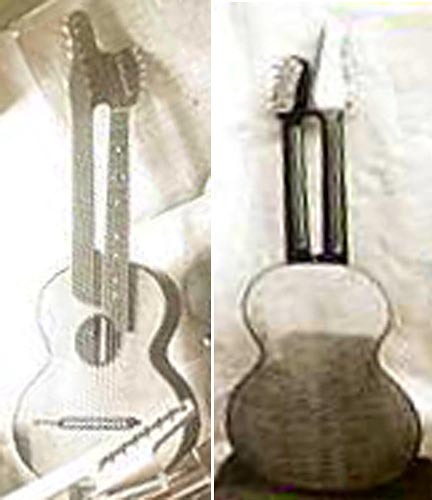 To understand why they are classified as such today, it is imperative that you first thoroughly read and comprehend the site author's thesis. 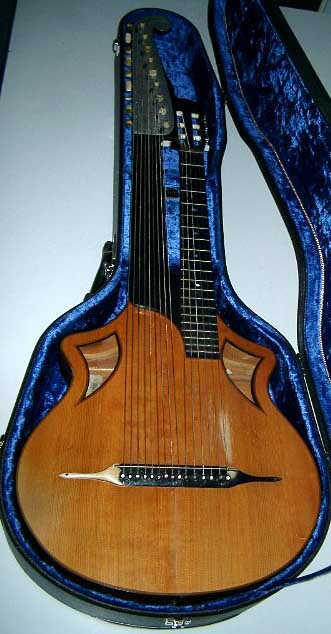 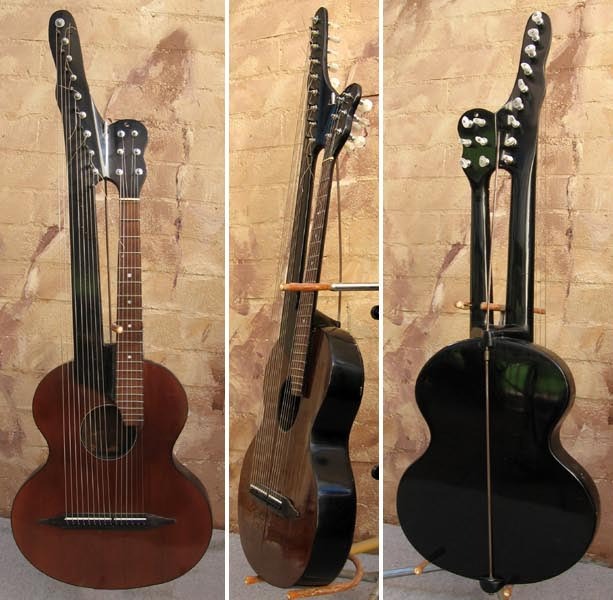 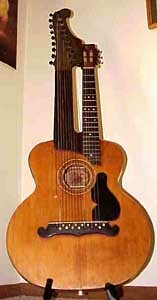 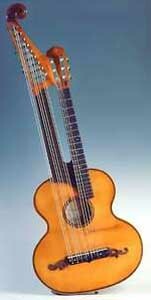 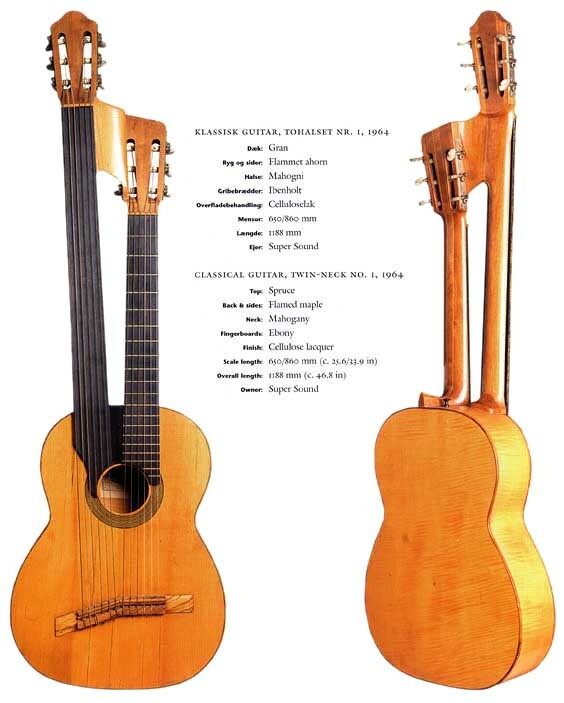 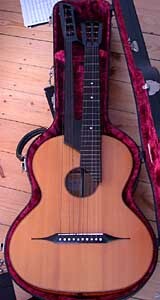 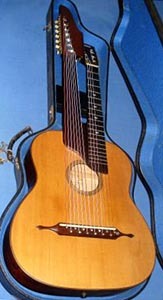 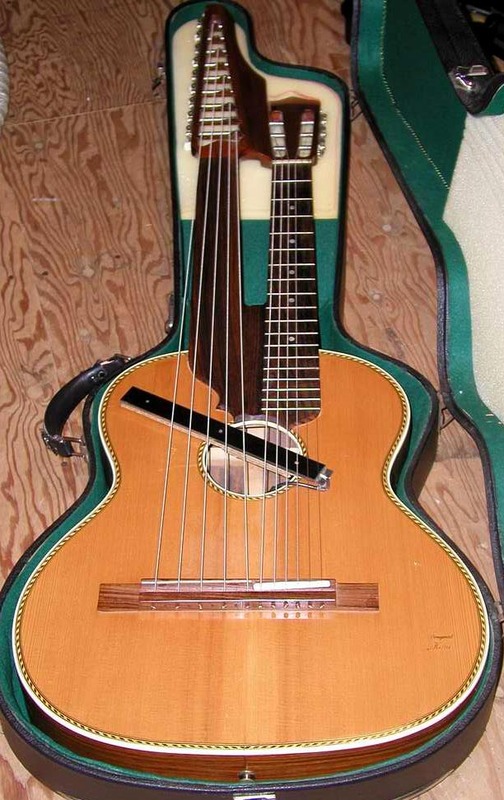 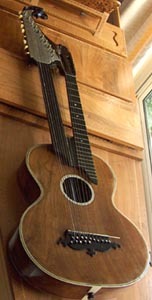 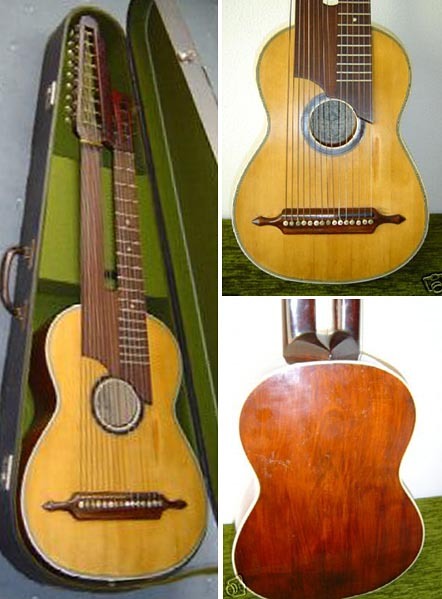 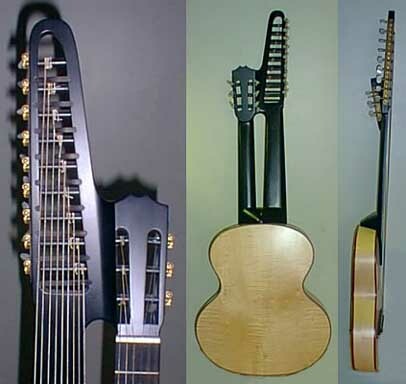 Note that this has 12 strings on the neck, with 4 single basses - so it is a 10-course, 16-string instrument. 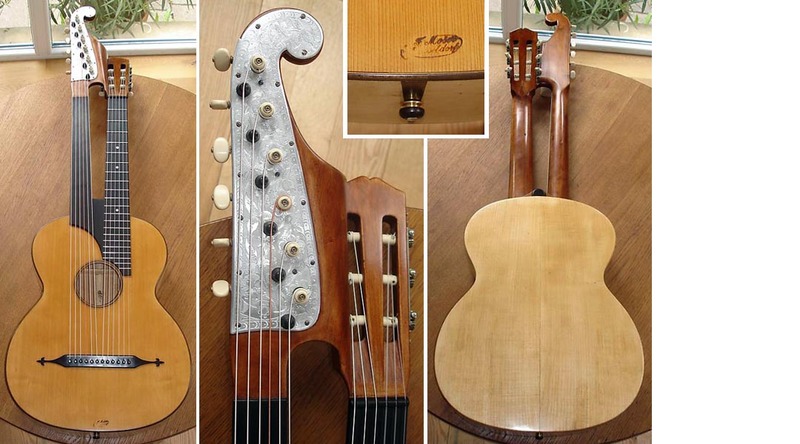 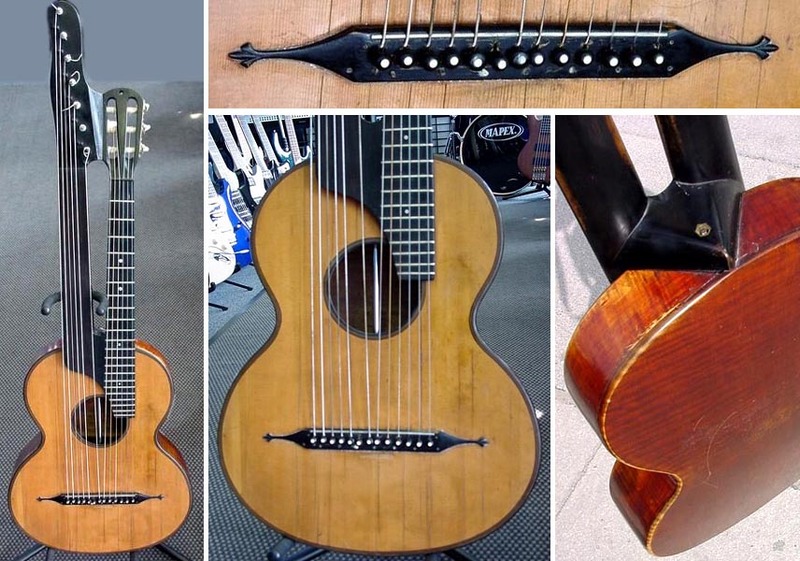 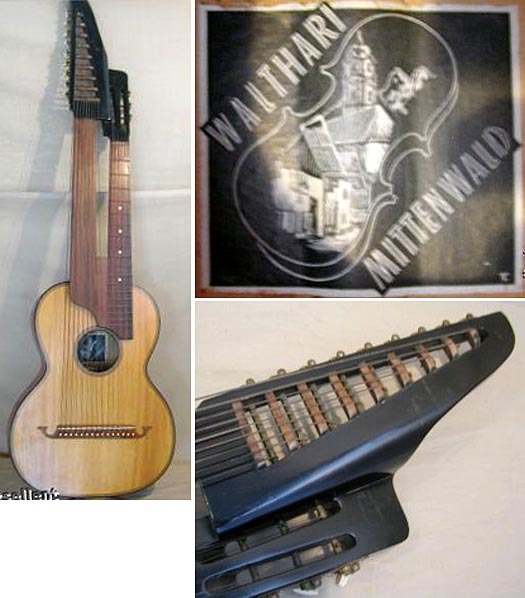 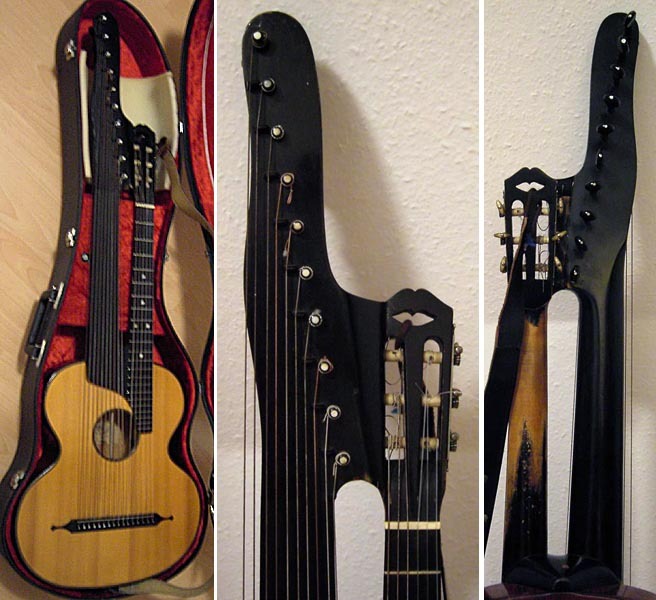 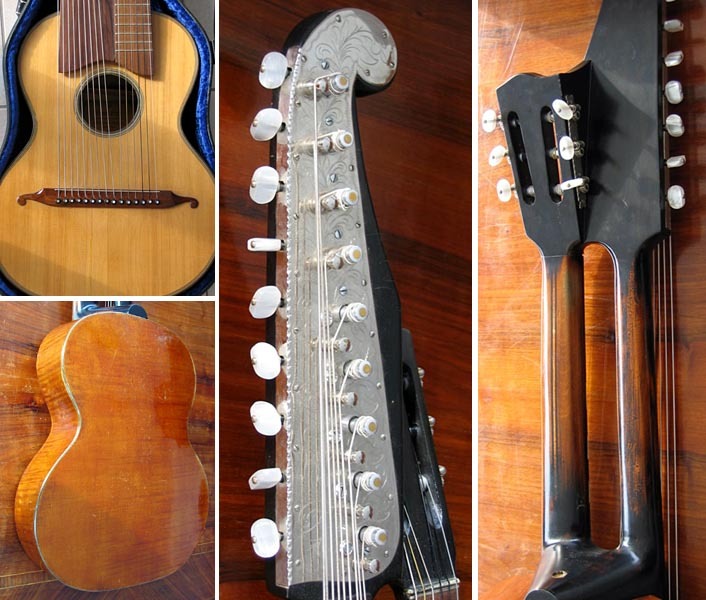 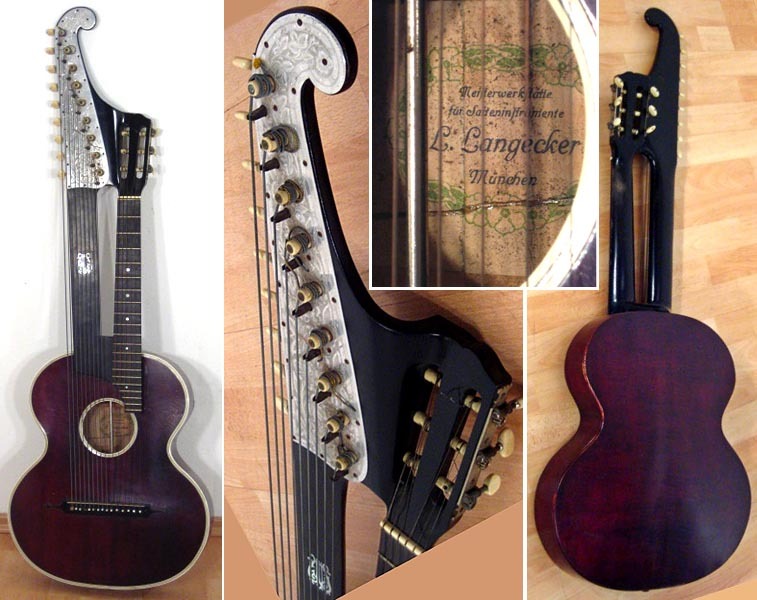 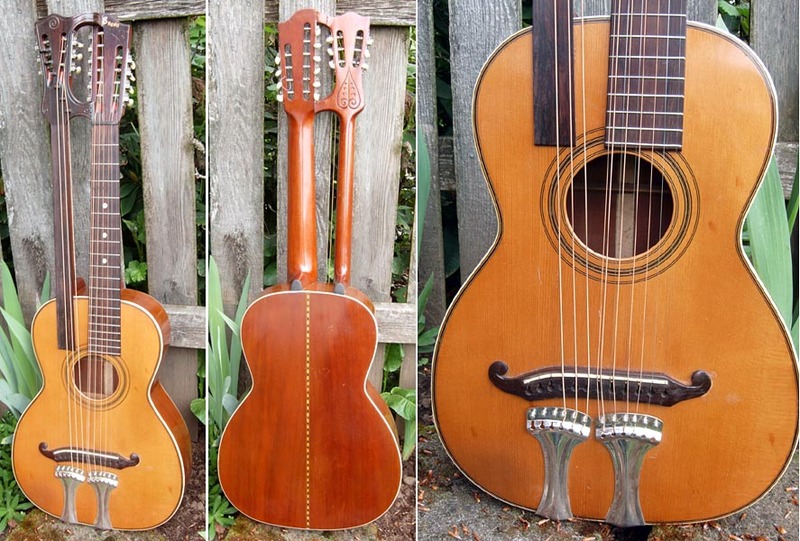 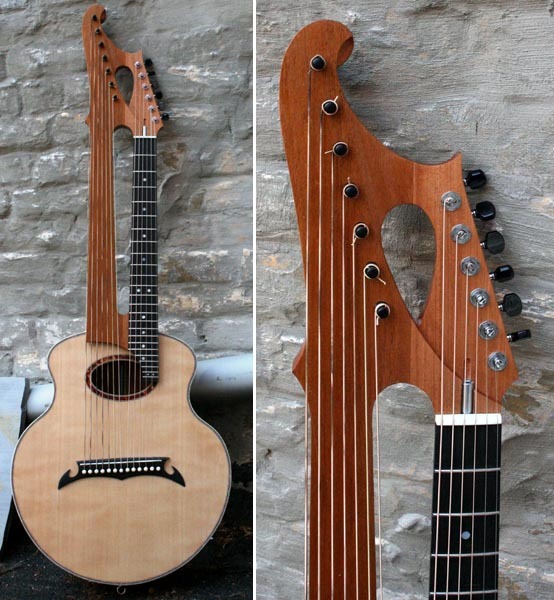 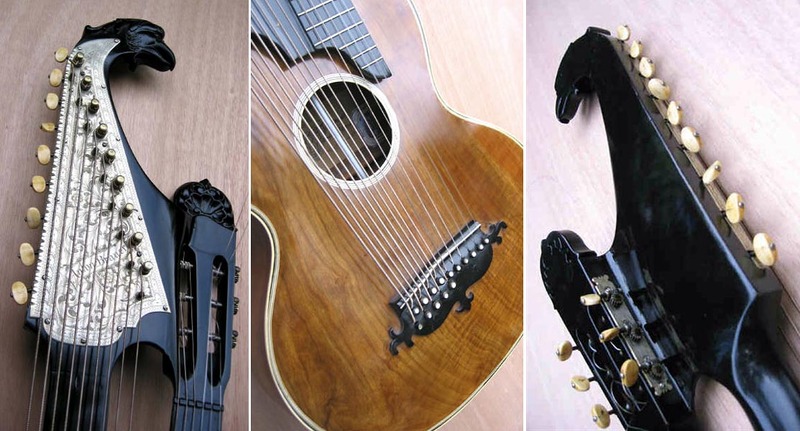 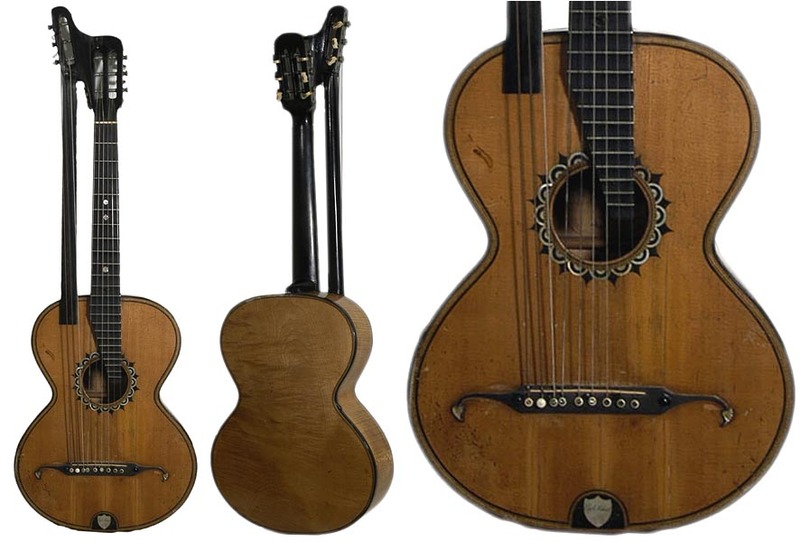 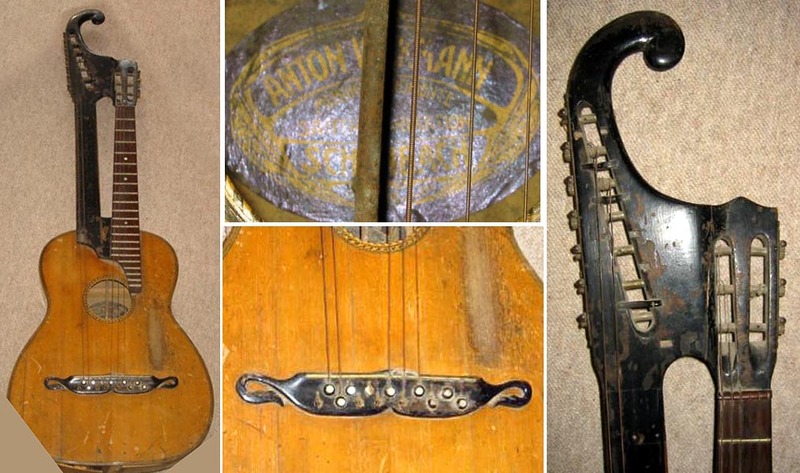 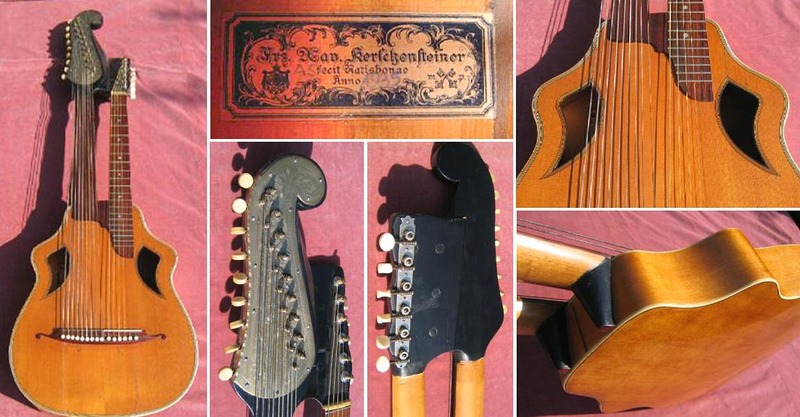 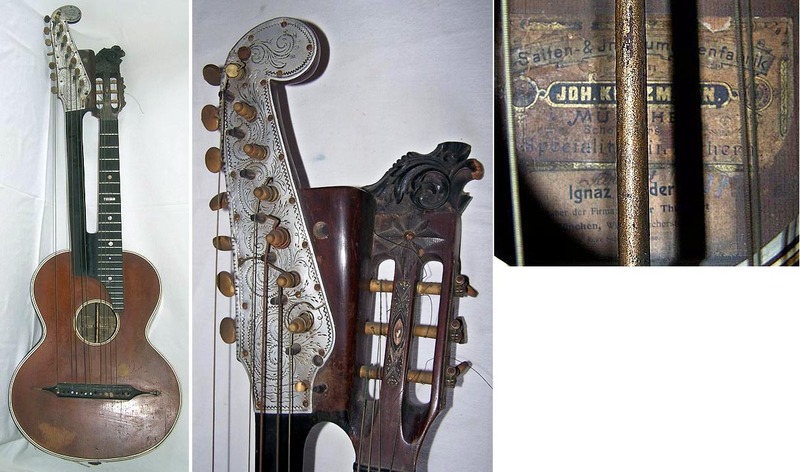 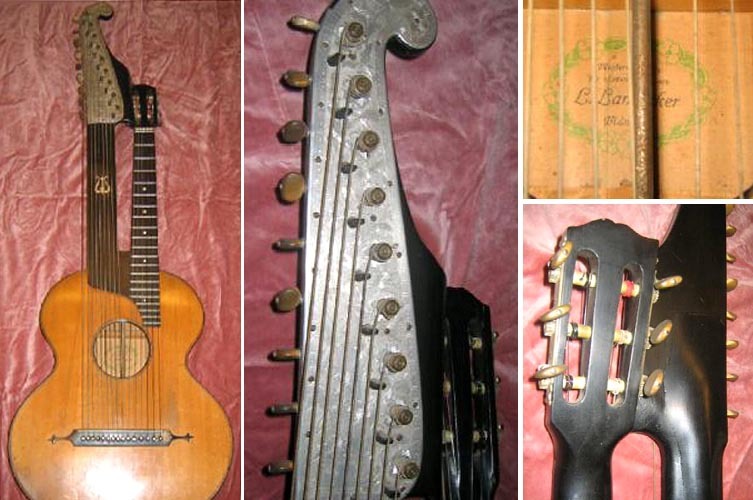 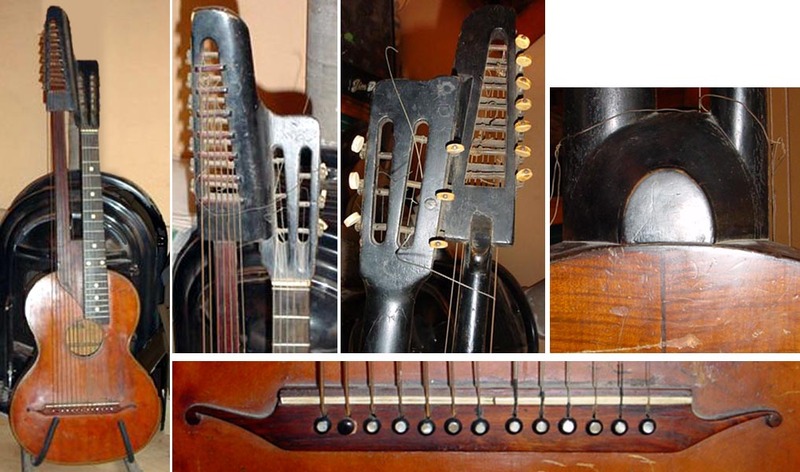 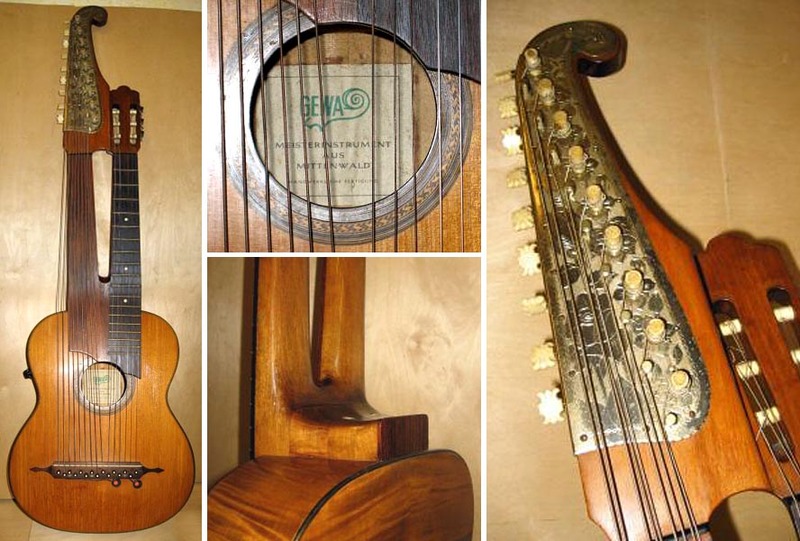 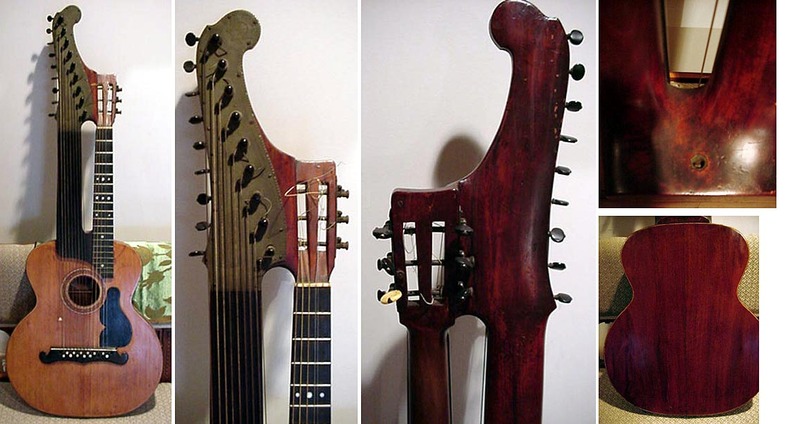 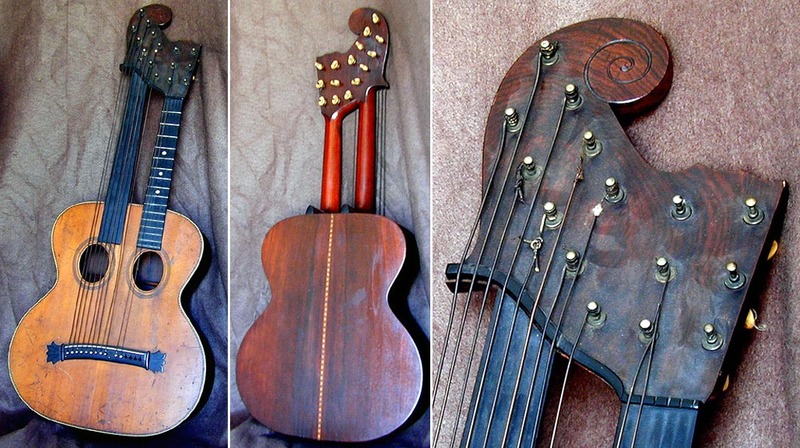 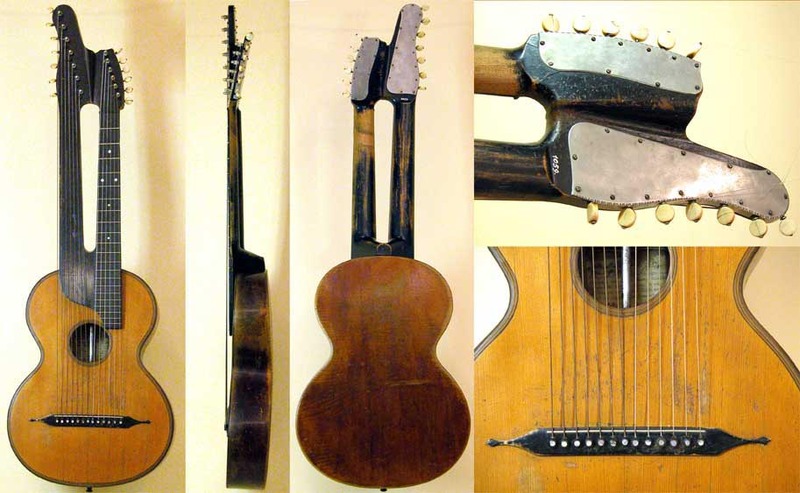 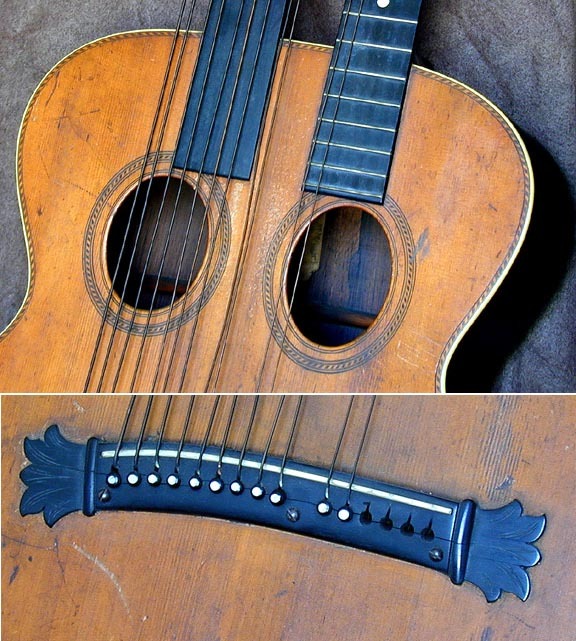 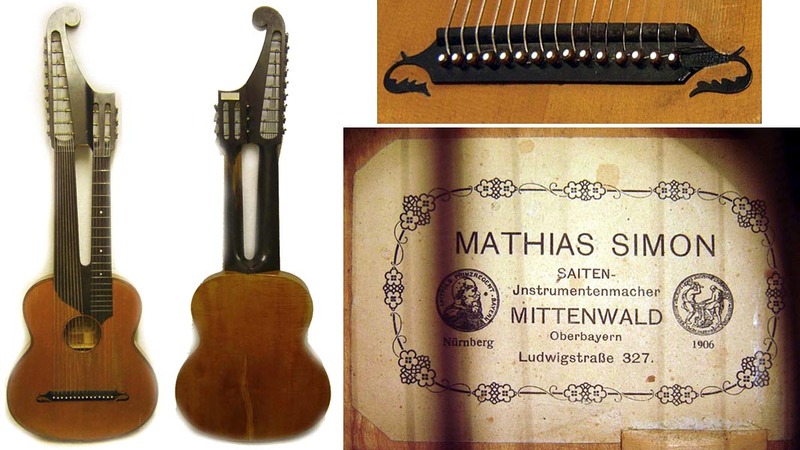 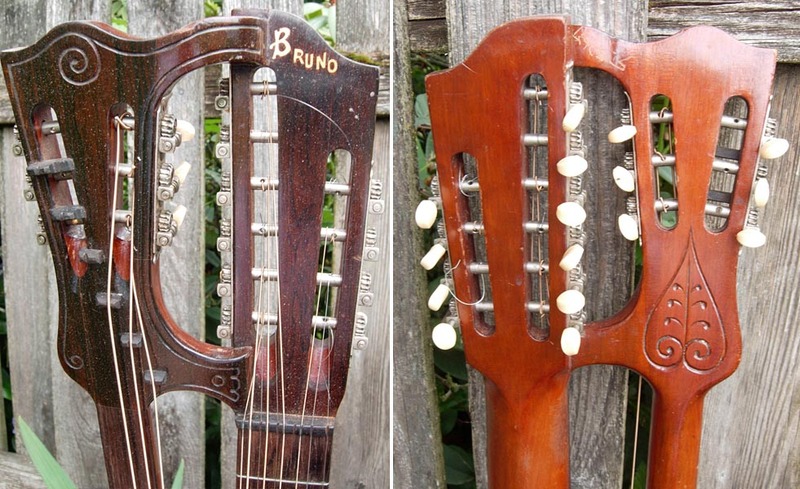 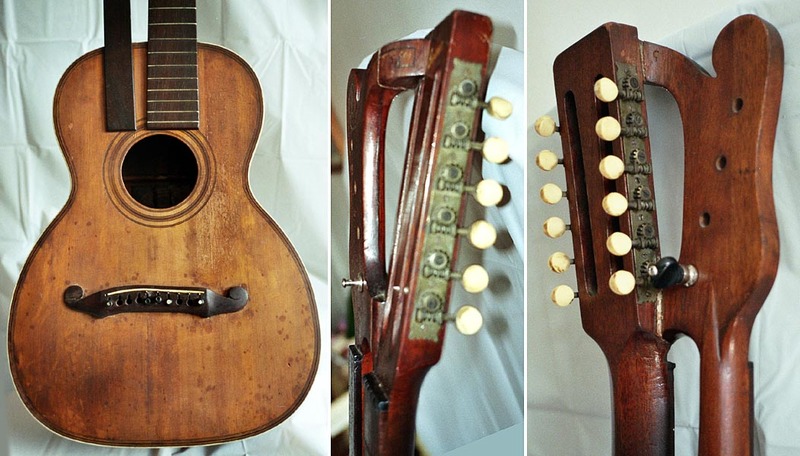 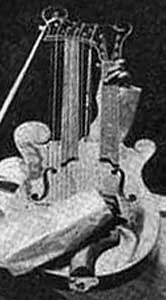 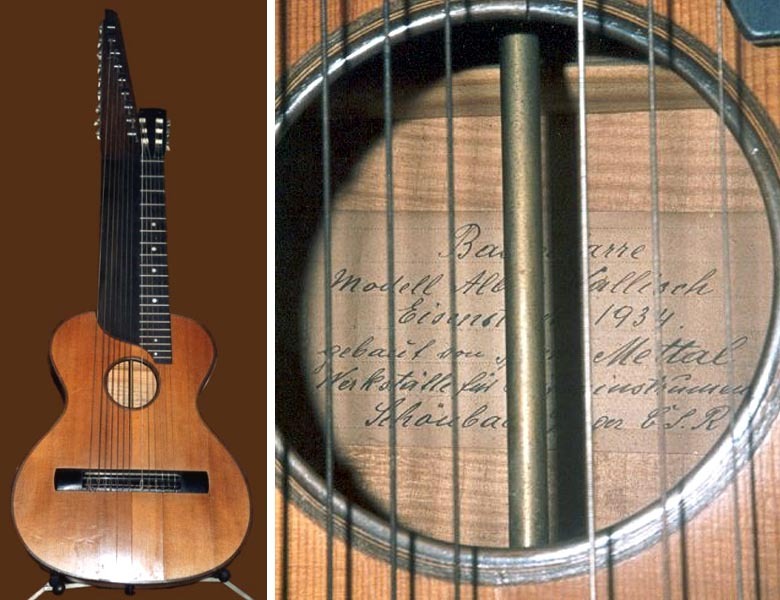 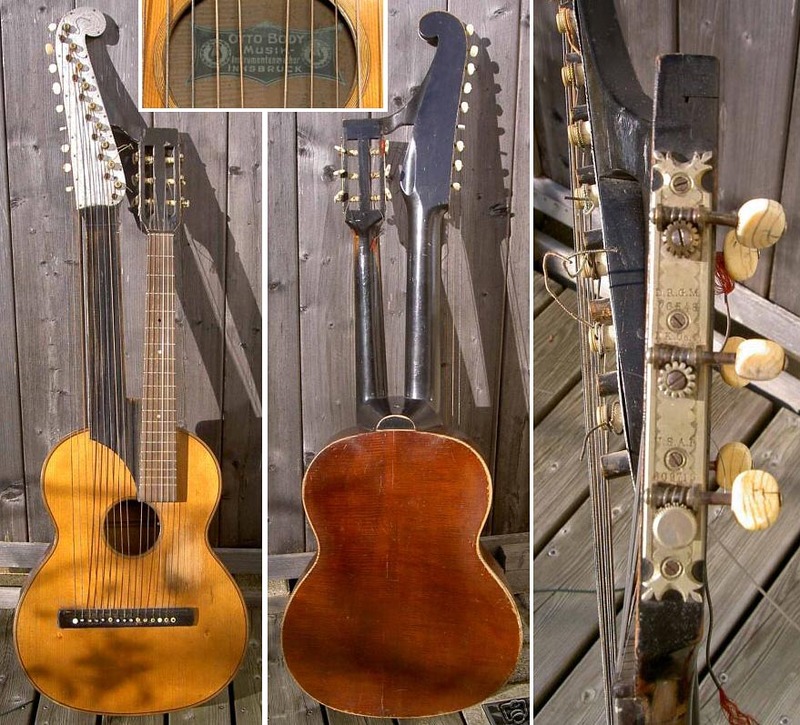 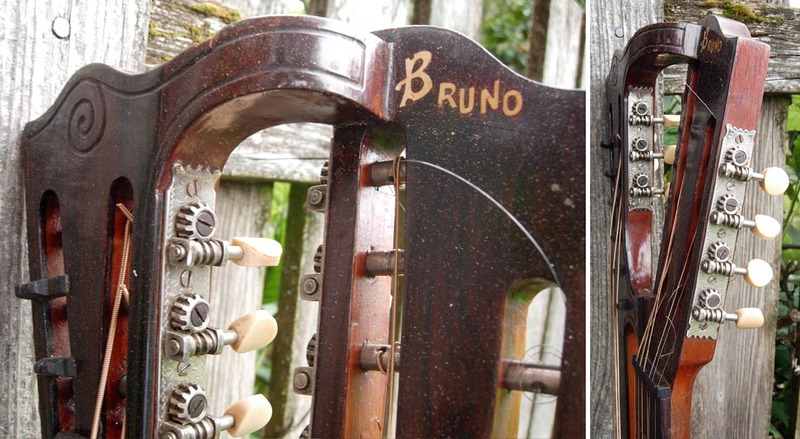 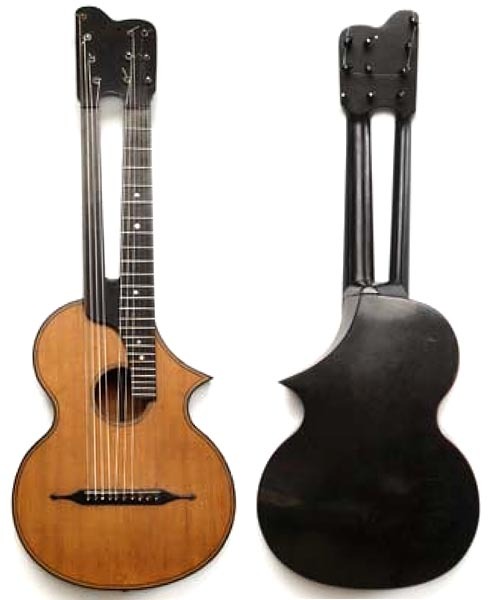 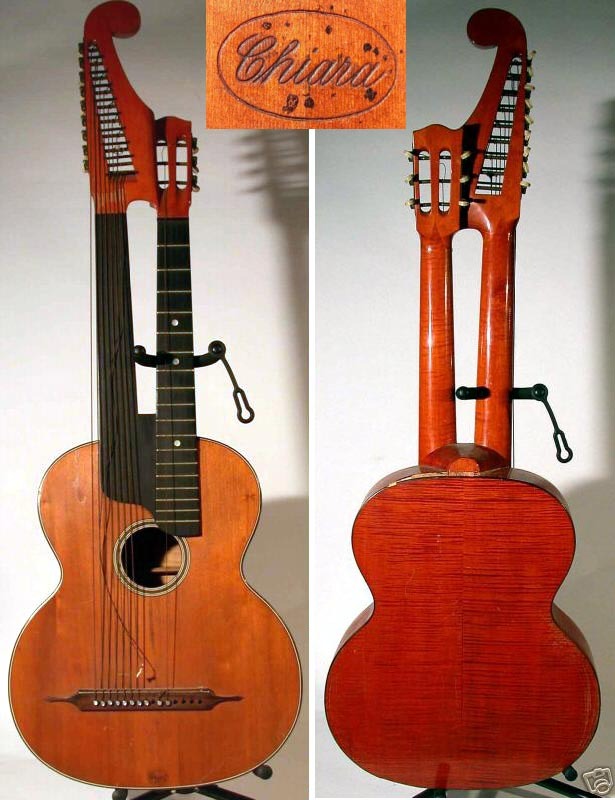 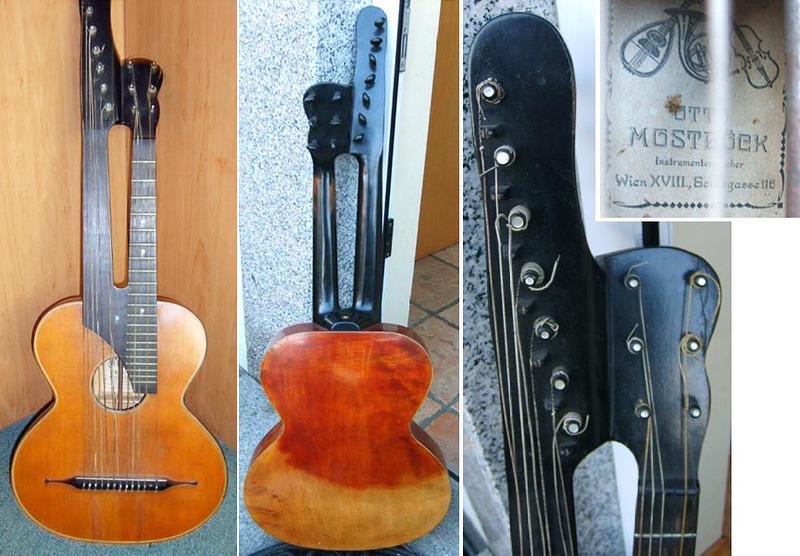 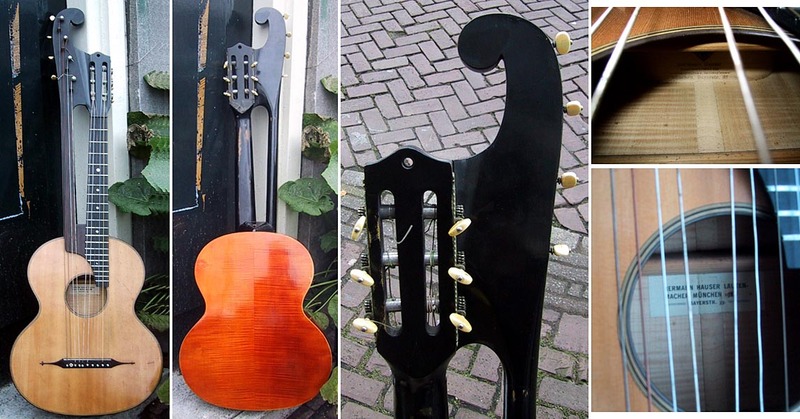 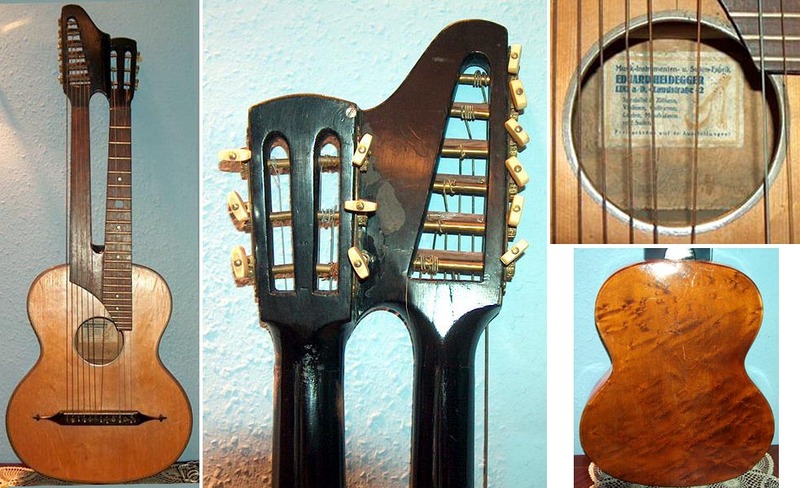 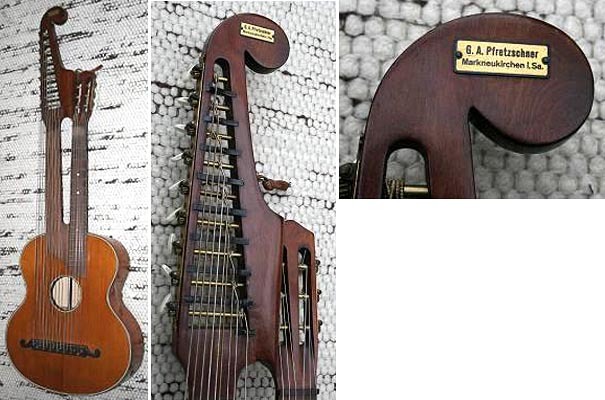 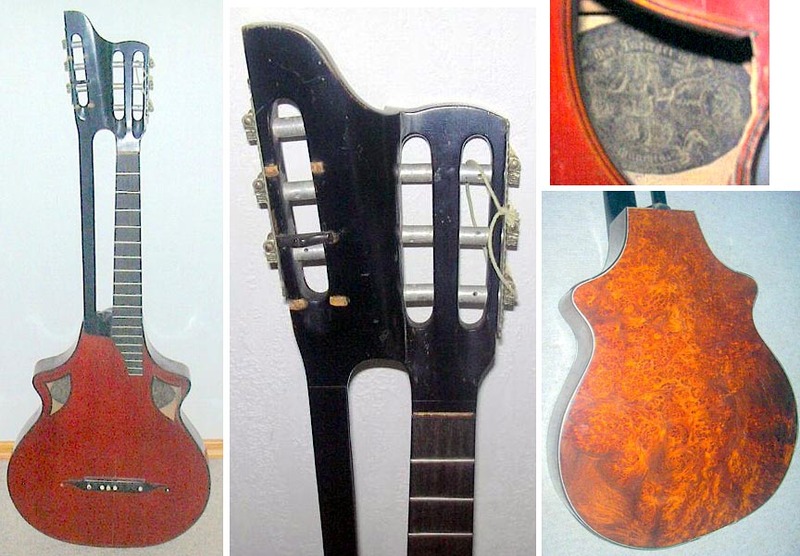 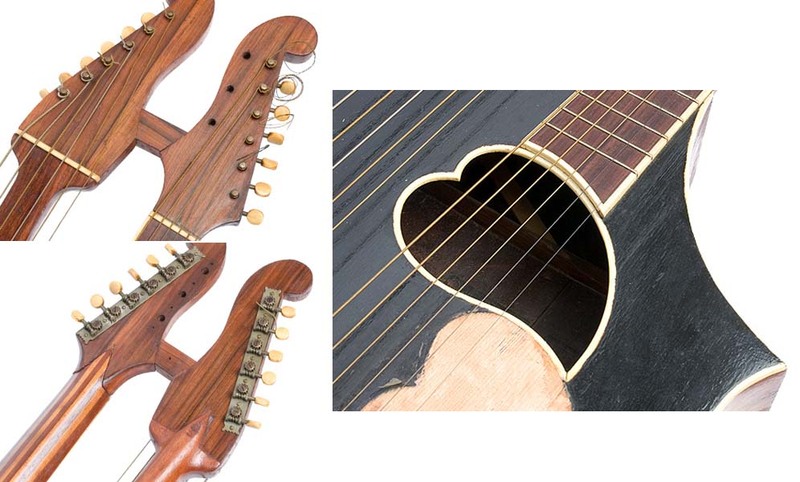 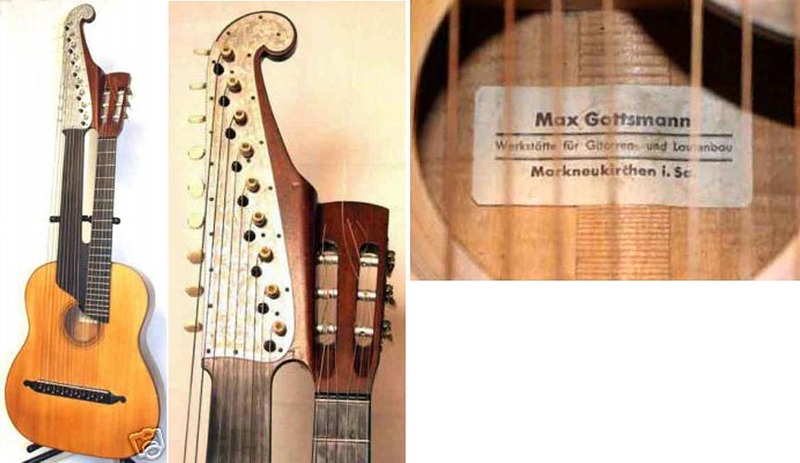 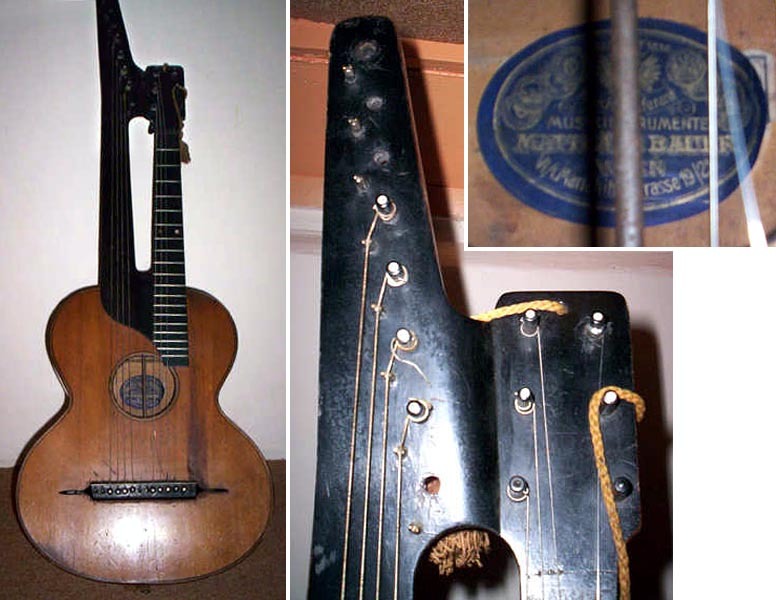 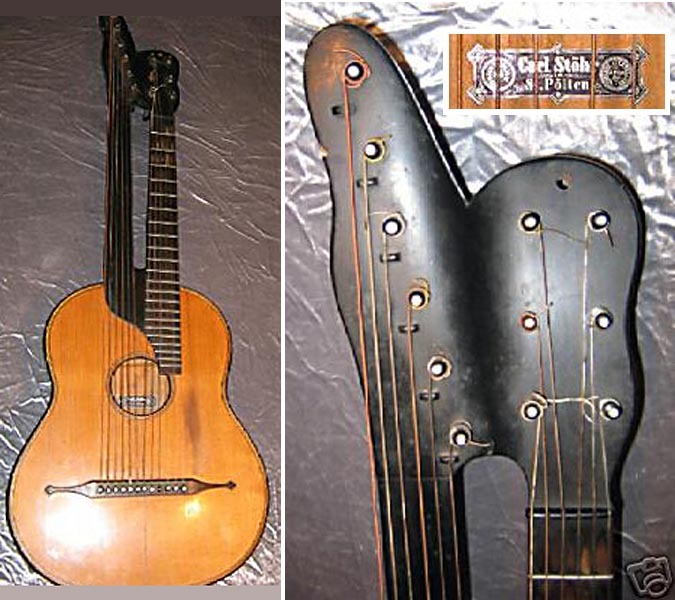 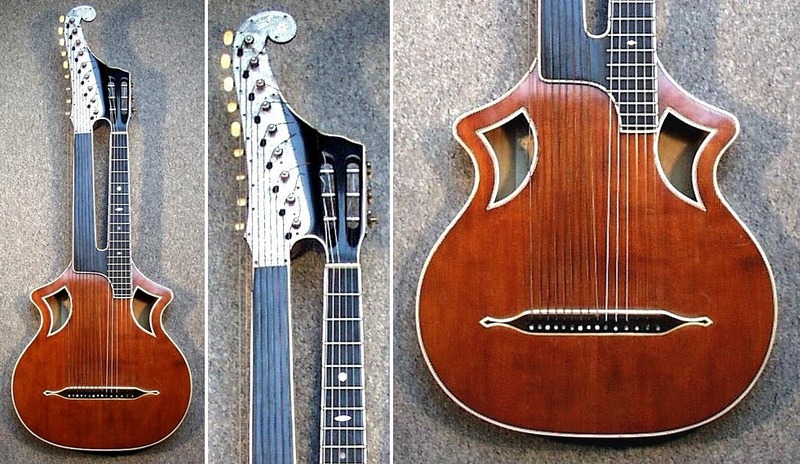 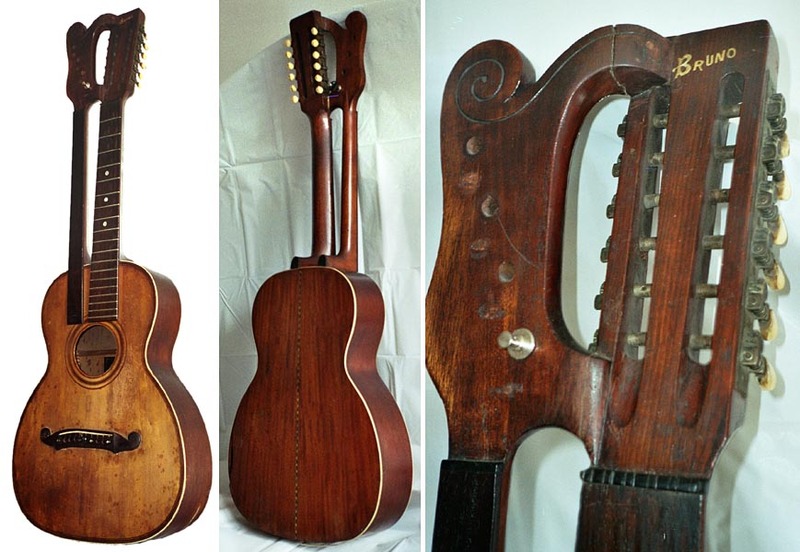 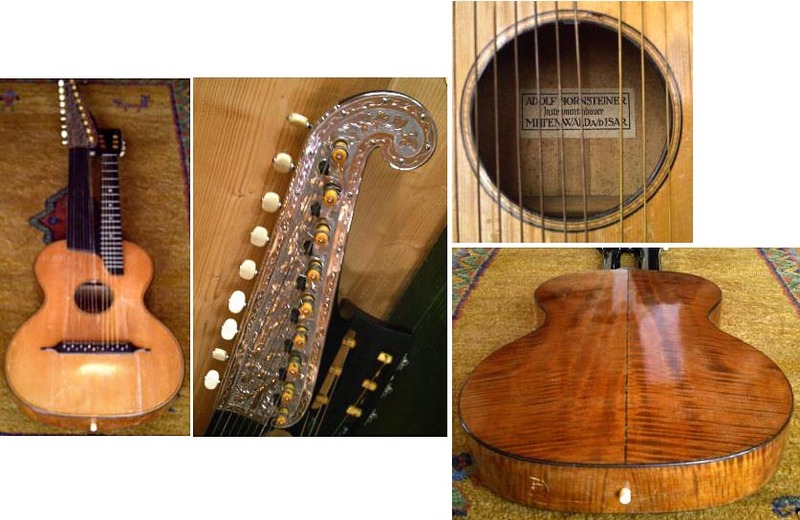 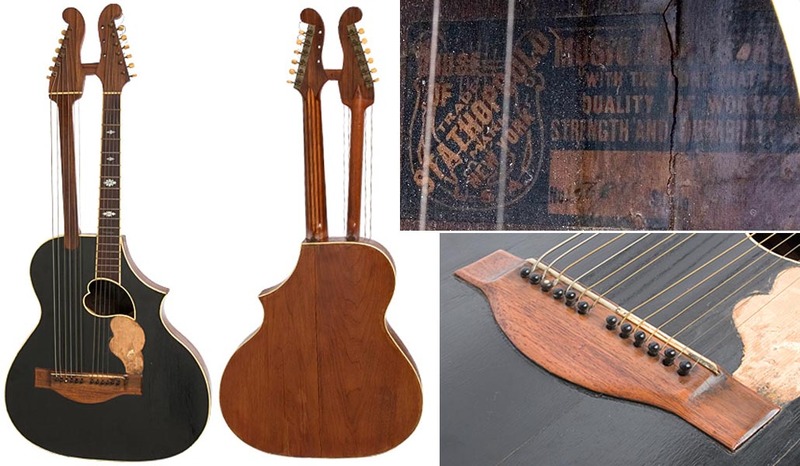 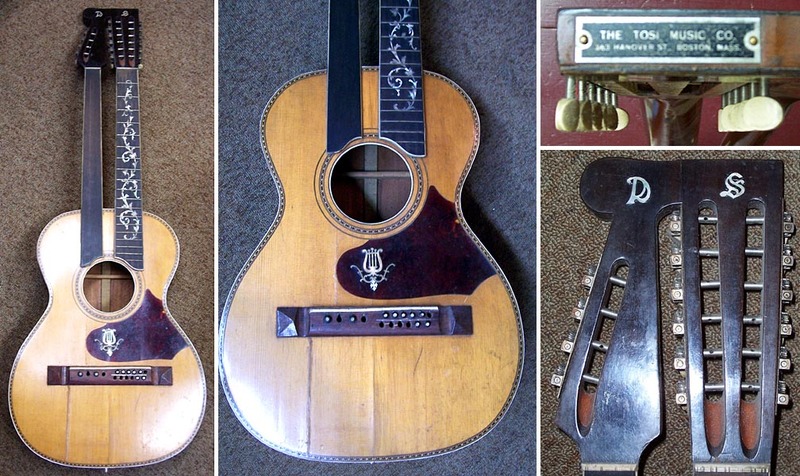 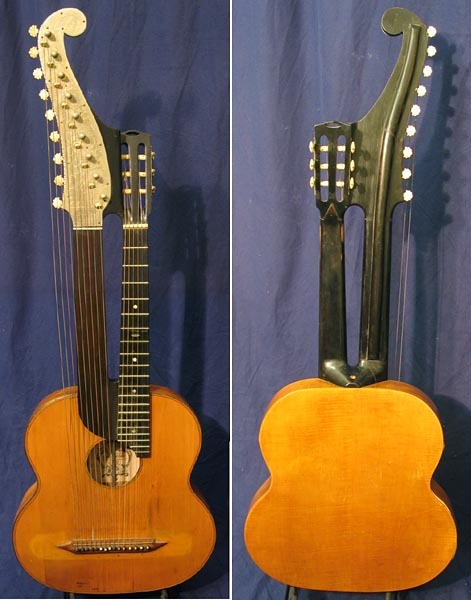 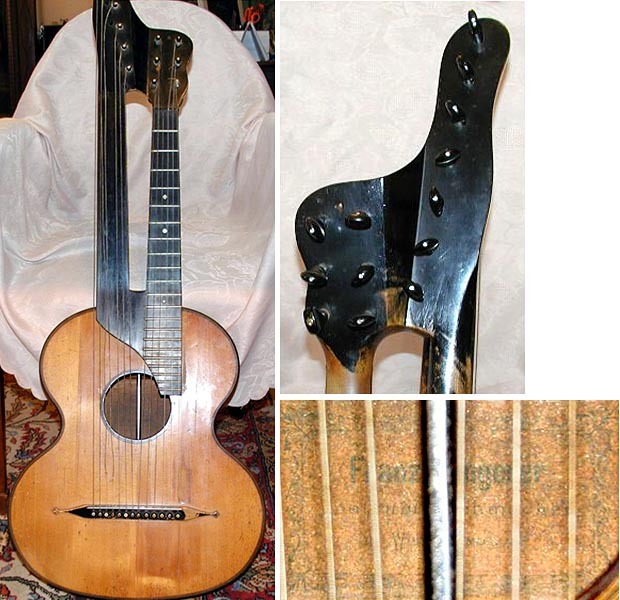 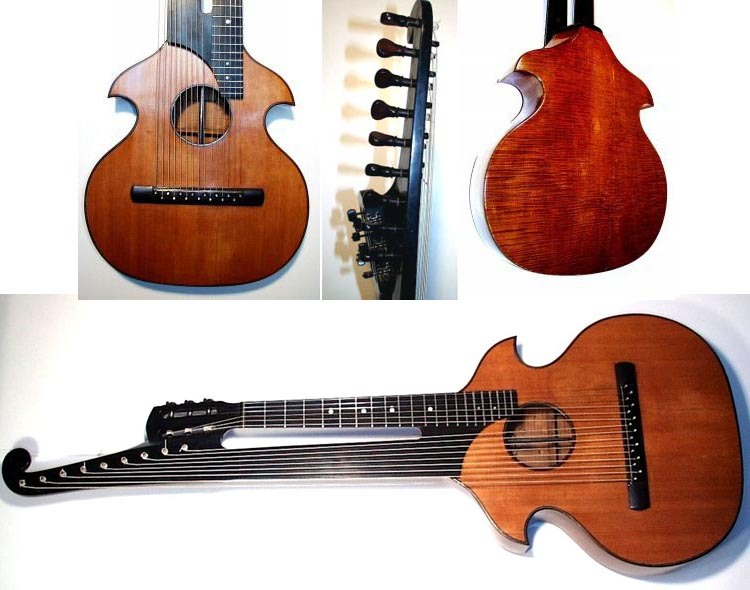 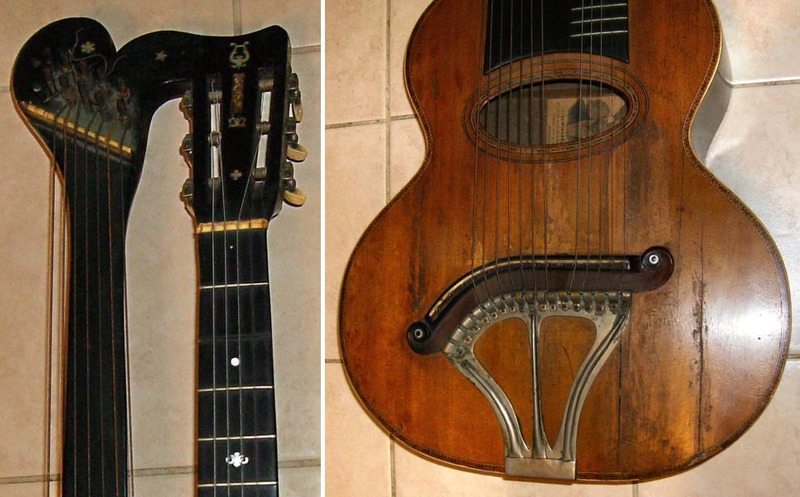 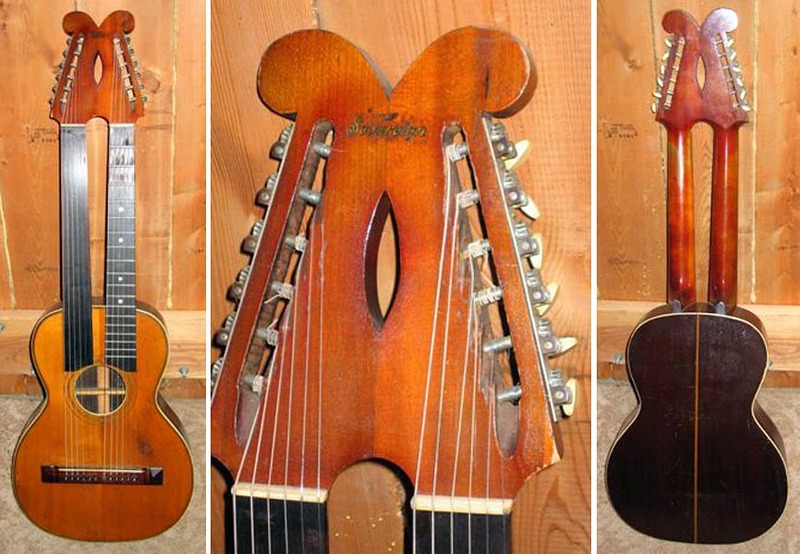 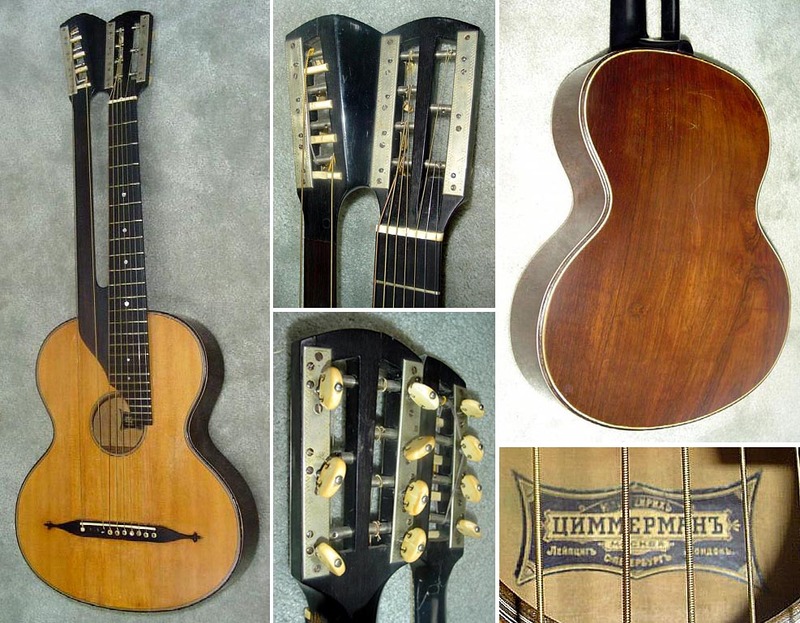 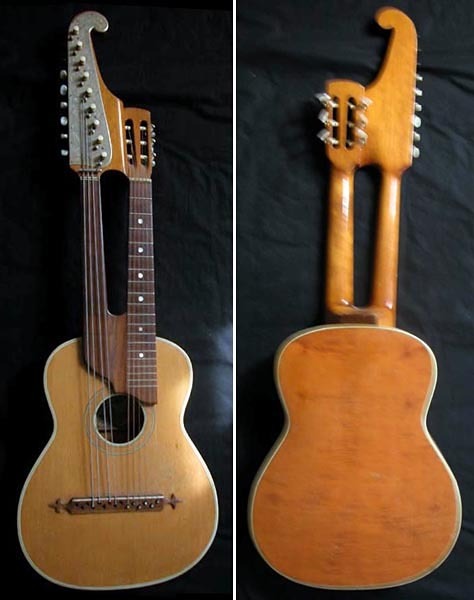 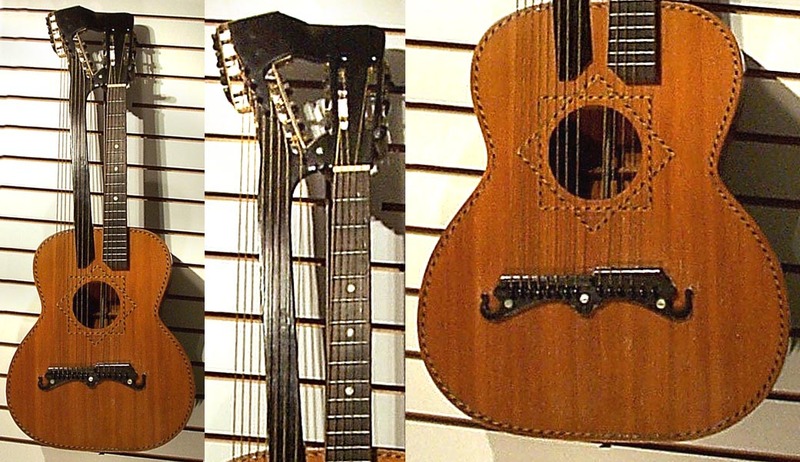 This unusual specimen is also a 12-course instrument with 16 strings, but with a twist! 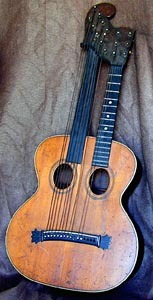 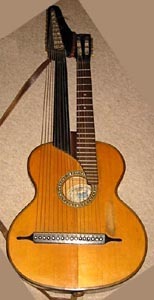 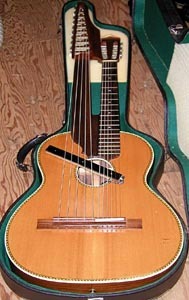 It has 6 single basses and the high two courses on the neck are not doubled. 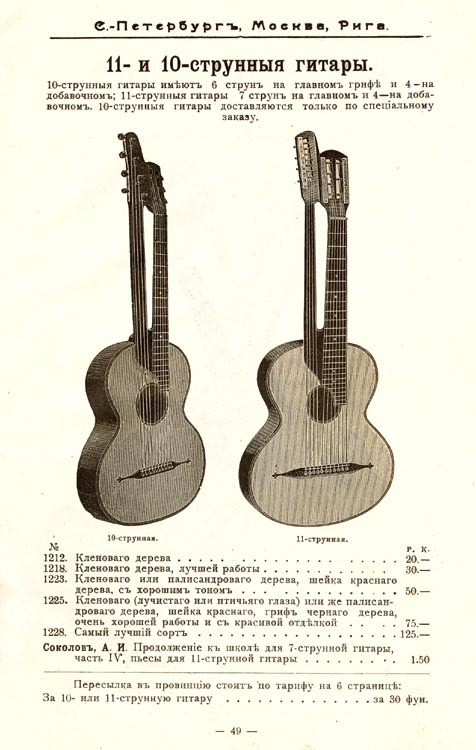 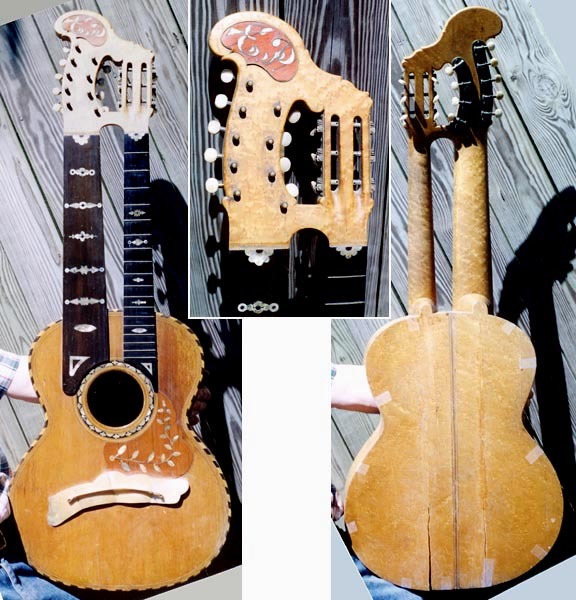 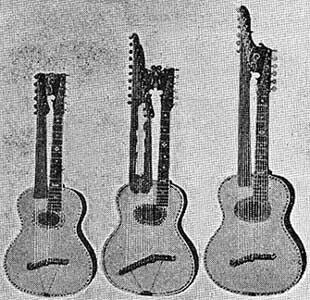 Note the carving and tuner array. 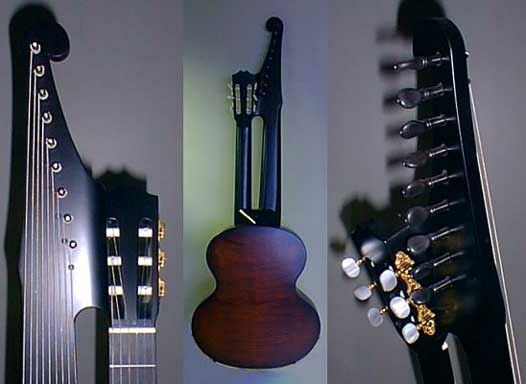 The 2 tailpieces are add-ons. 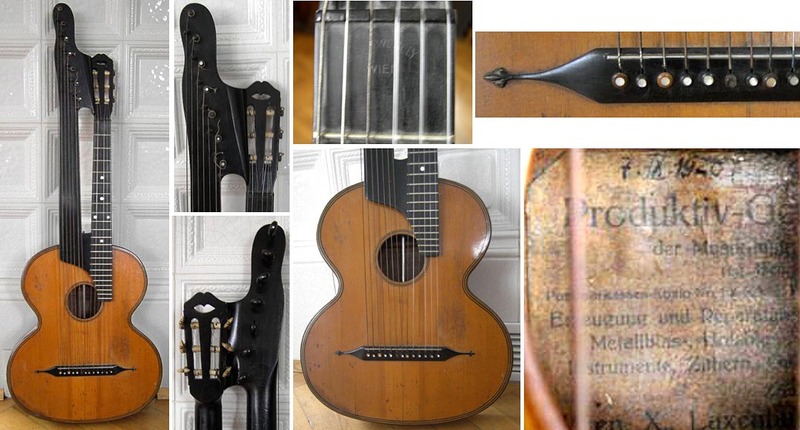 Additional images 2 "The Tosi Music Company, 63 Hanover Street, Boston, Mass"
Clearly the same maker, played by Salvatore de Natale from 1920-1938. 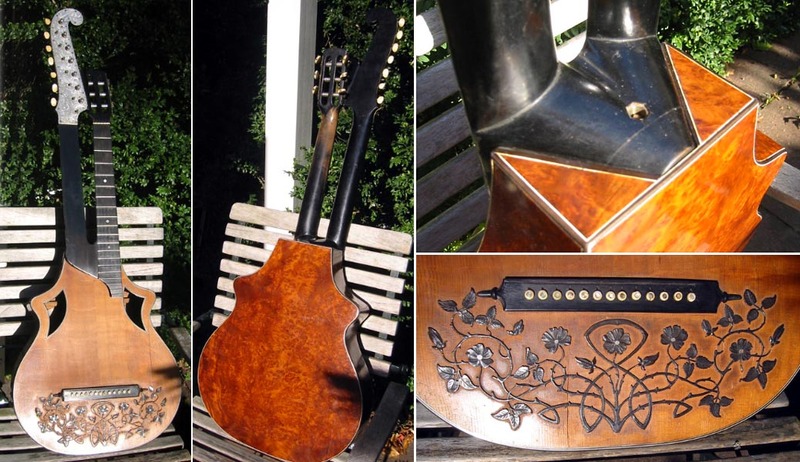 Courtesy of Sheri Mignano Crawford, "Mandolins, Like Salami"
Which Gallery to place this in? 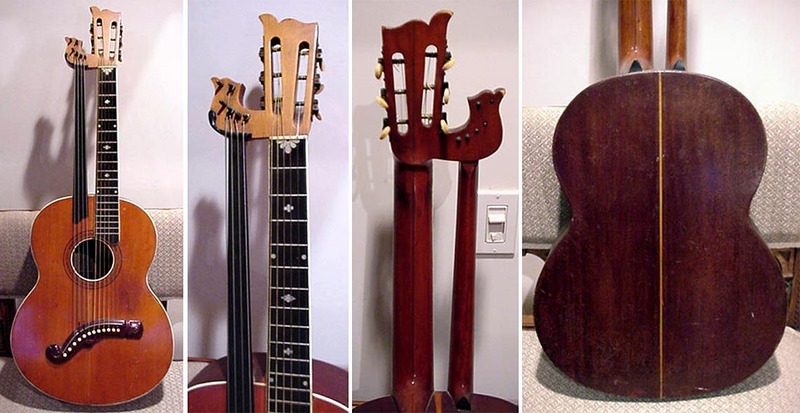 The two necks are joined as one solid neck! 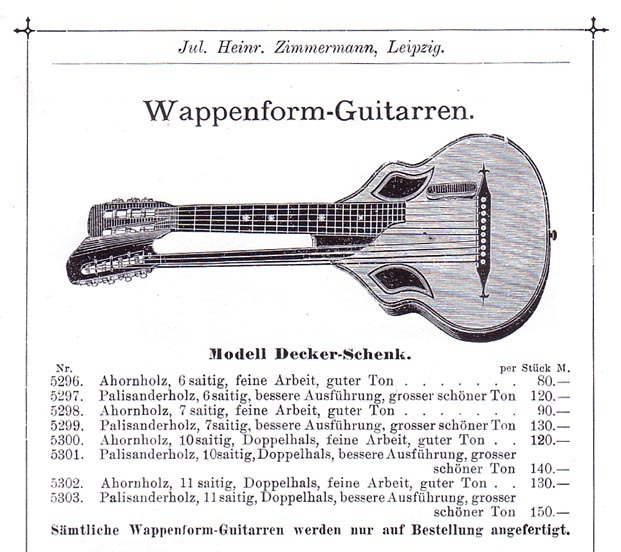 Additional images Modern Scherzer adaptation by Bernhard Kresse Josef Swosil, Vienna, 1879 (built for Anton Strommayer of the Schrammel Quartet) Geipel, Marie? 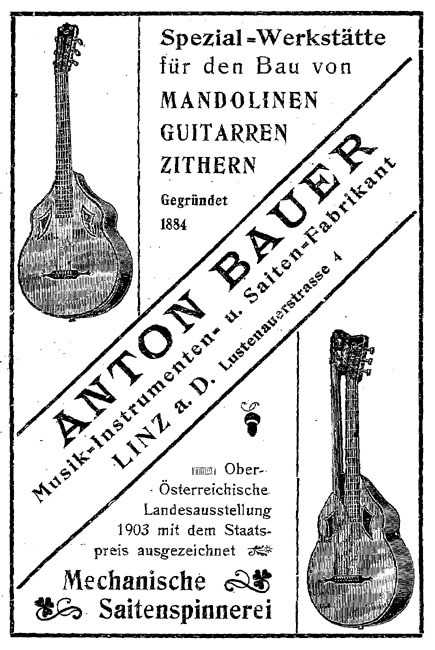 Franz Nowy J. Anton Staufer? 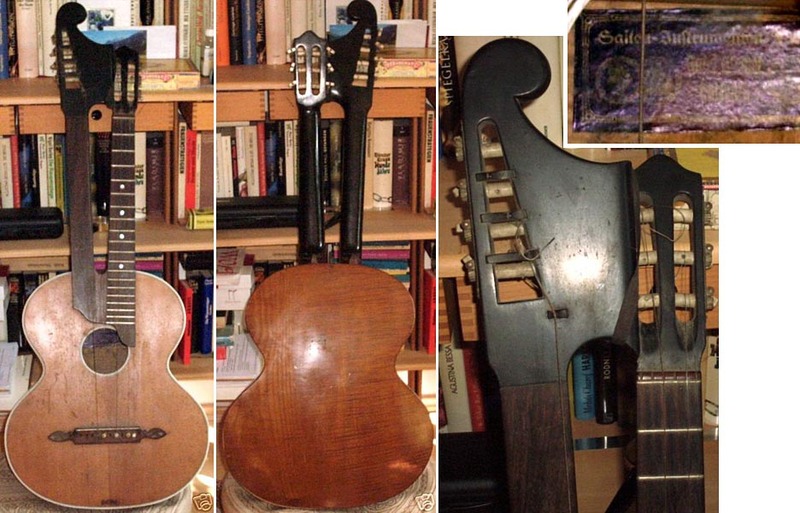 The instruments above offer an intriguing puzzle. 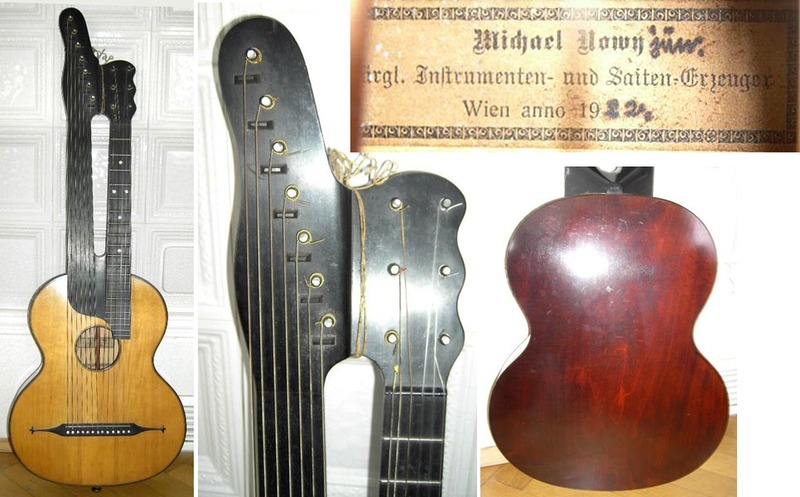 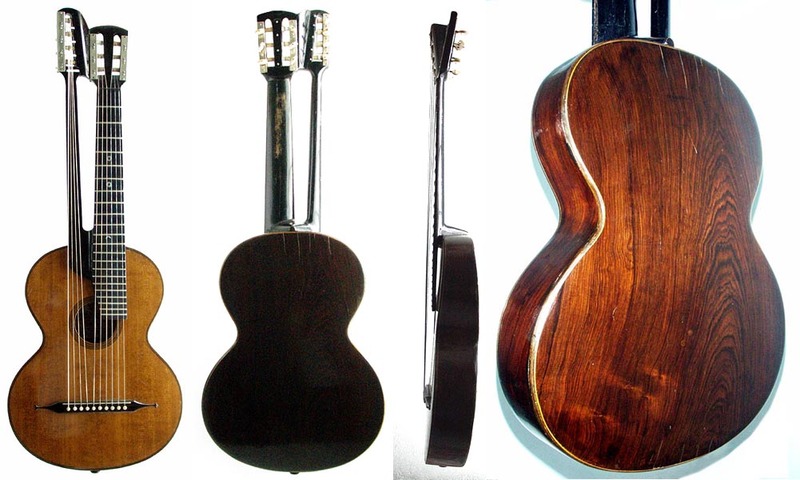 The Nowy is represented in a group of several different Vienese-style models shown in photographs of unknown vintage and provenance. 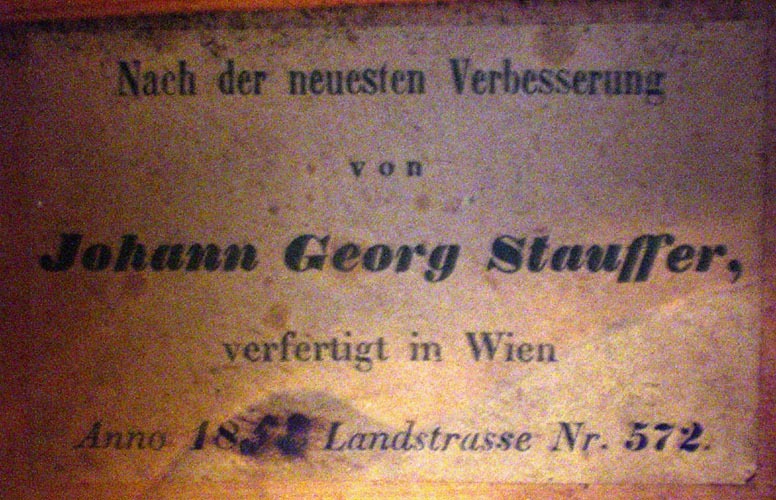 The alleged Staufer - dated 182X - is in the Kunsthistorisches Museum in Vienna. 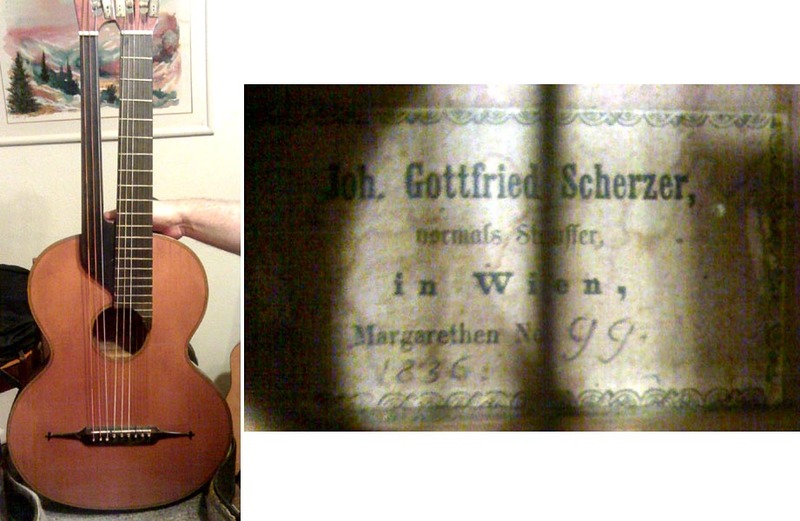 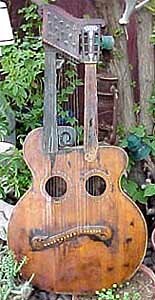 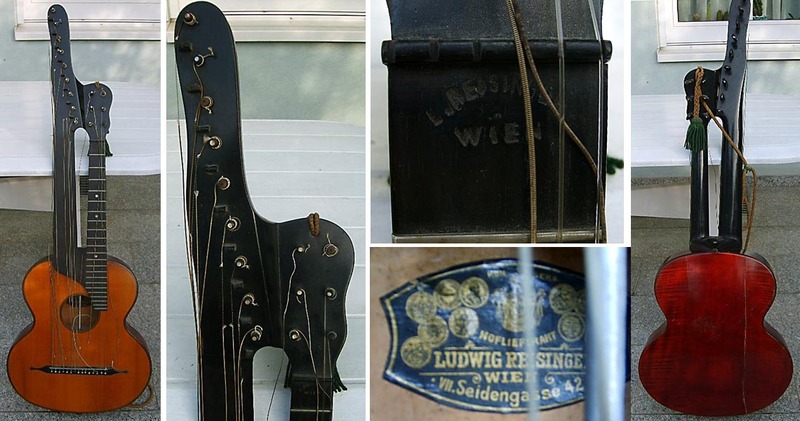 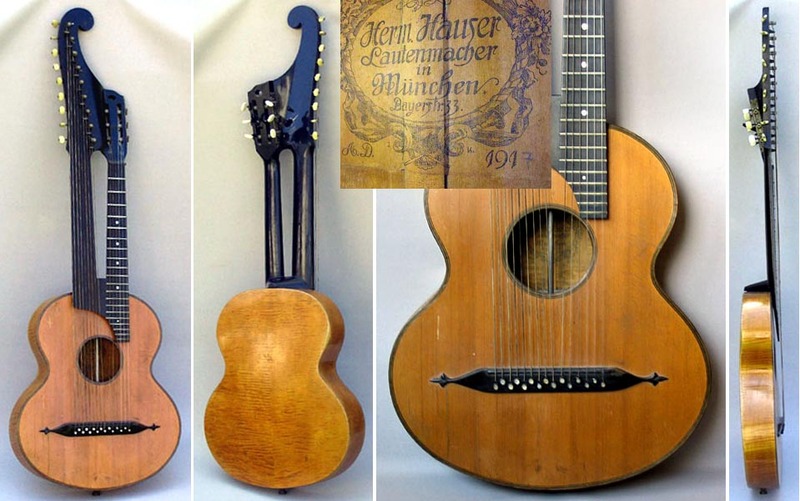 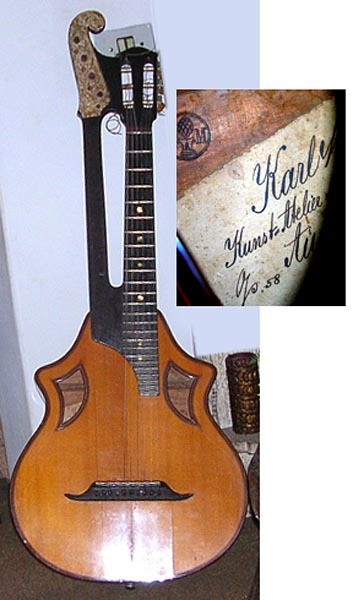 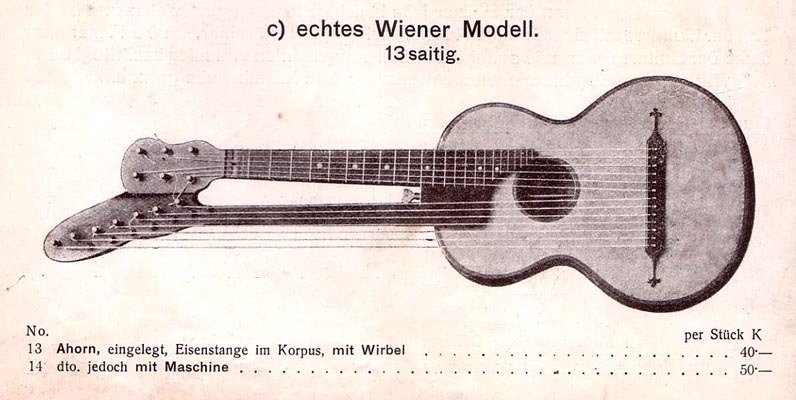 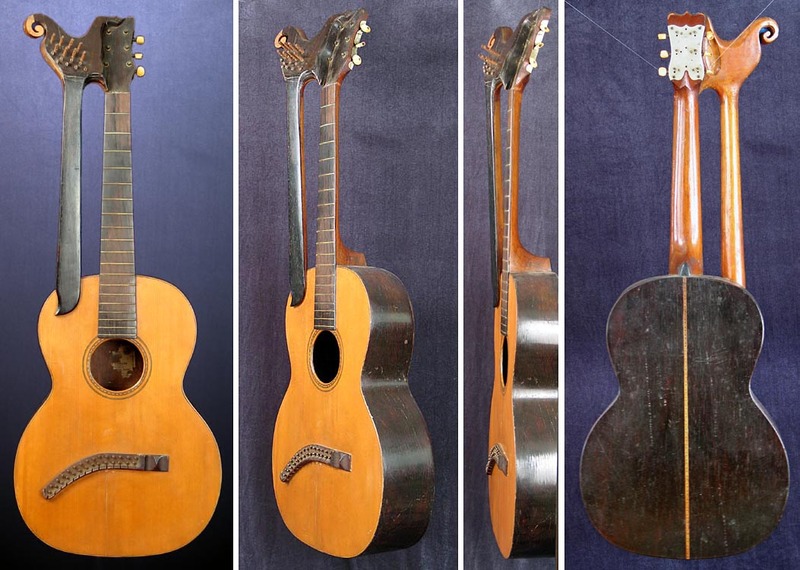 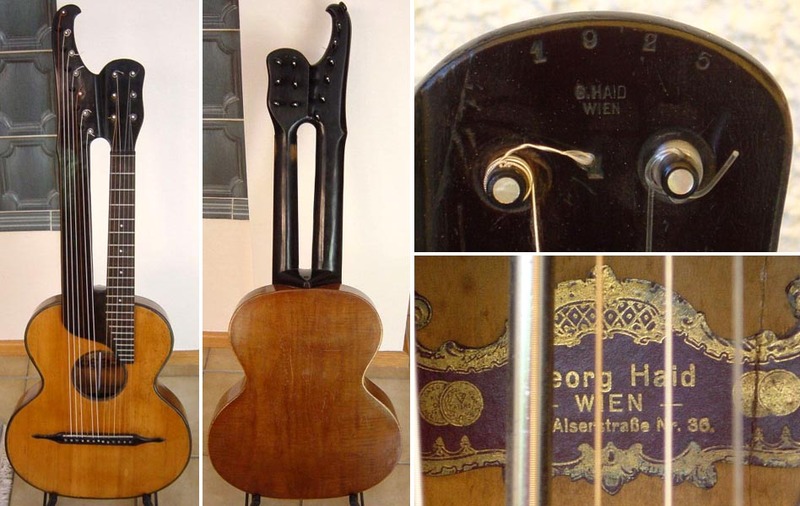 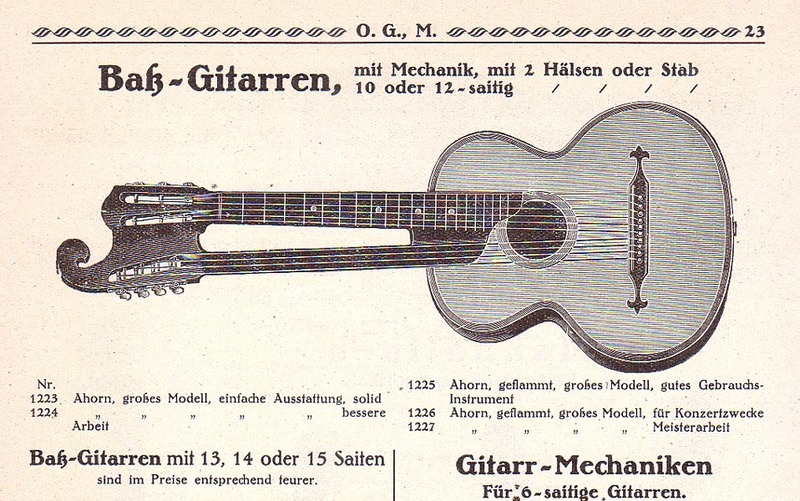 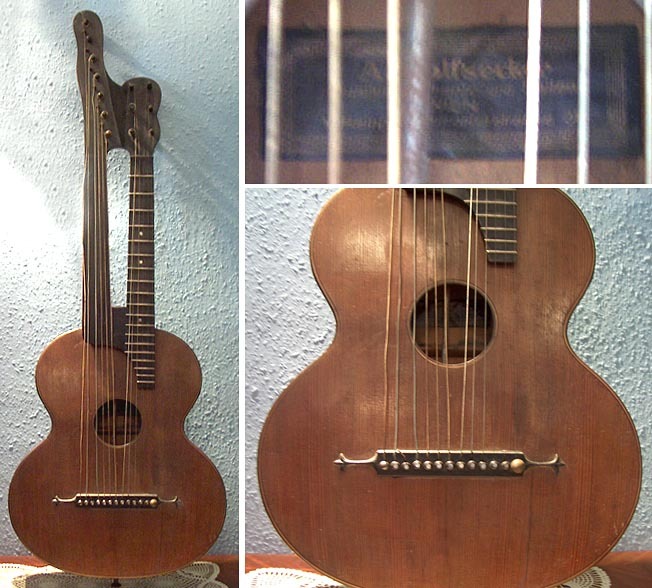 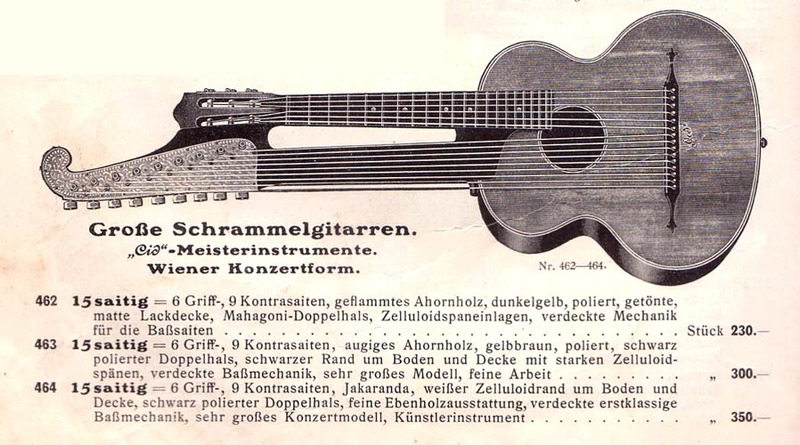 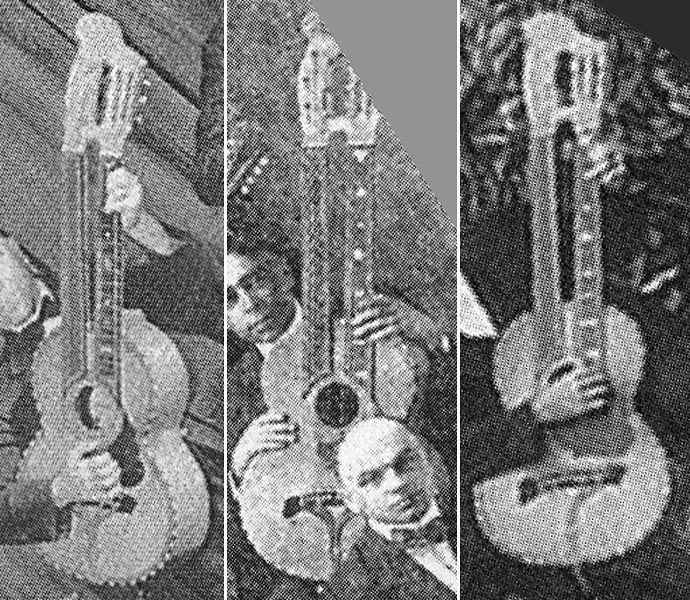 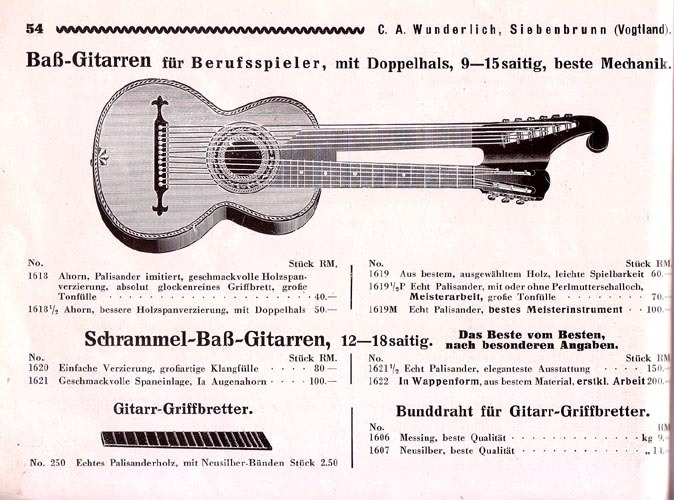 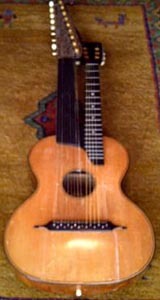 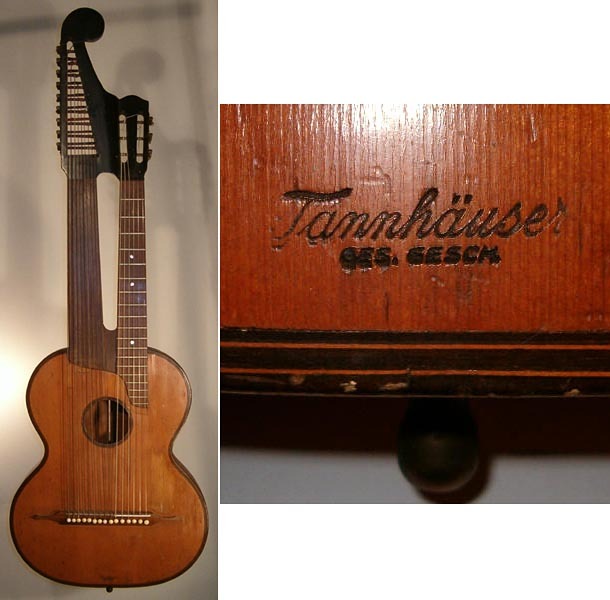 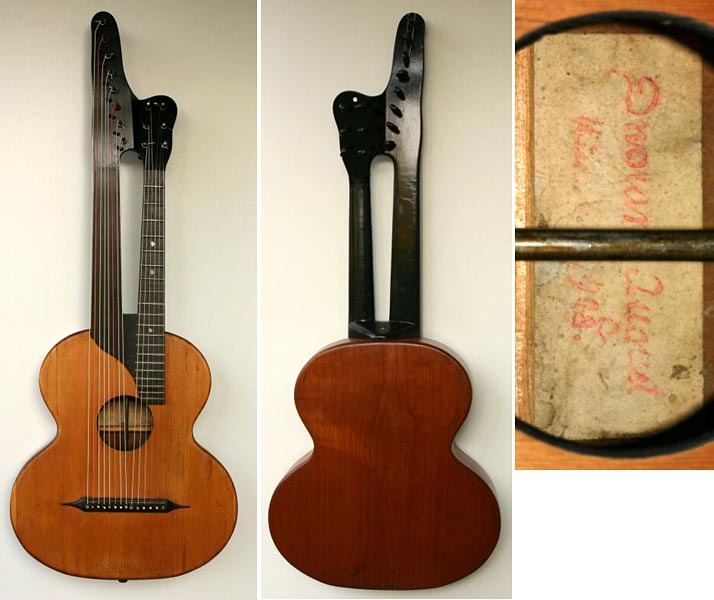 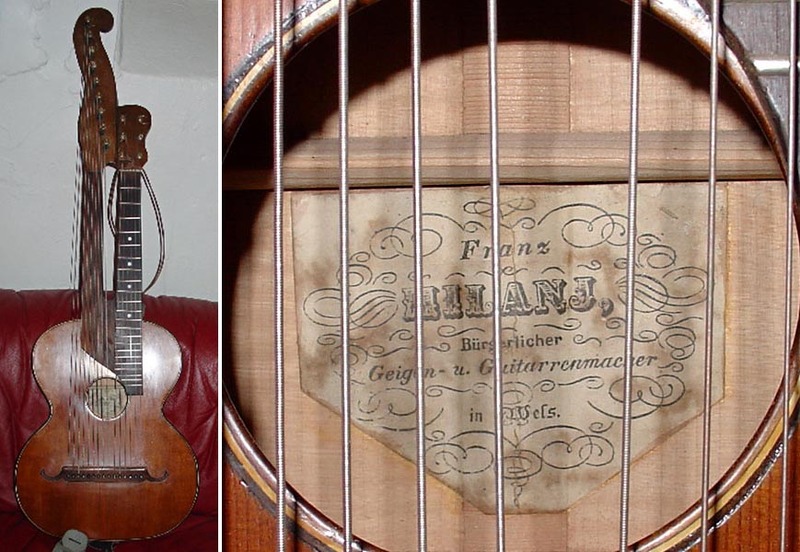 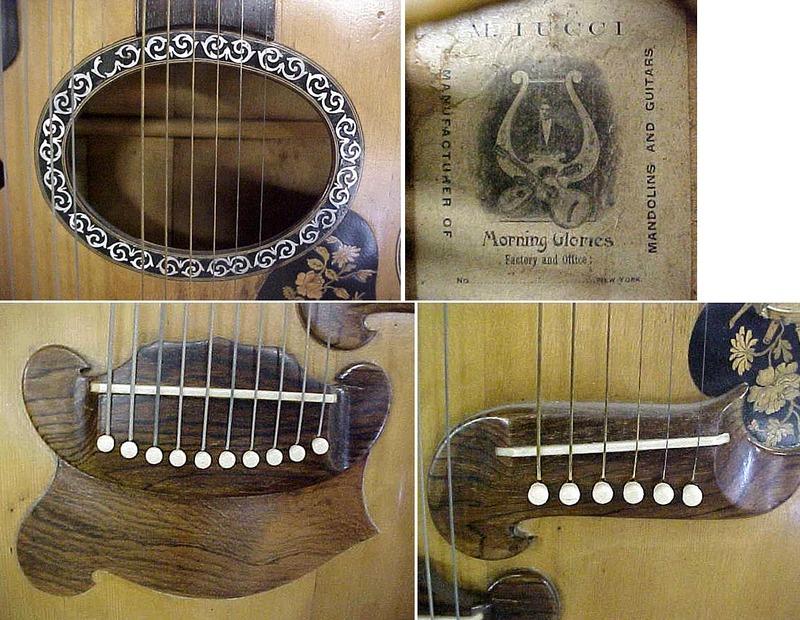 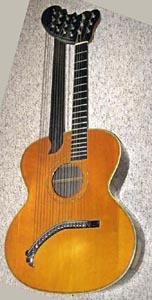 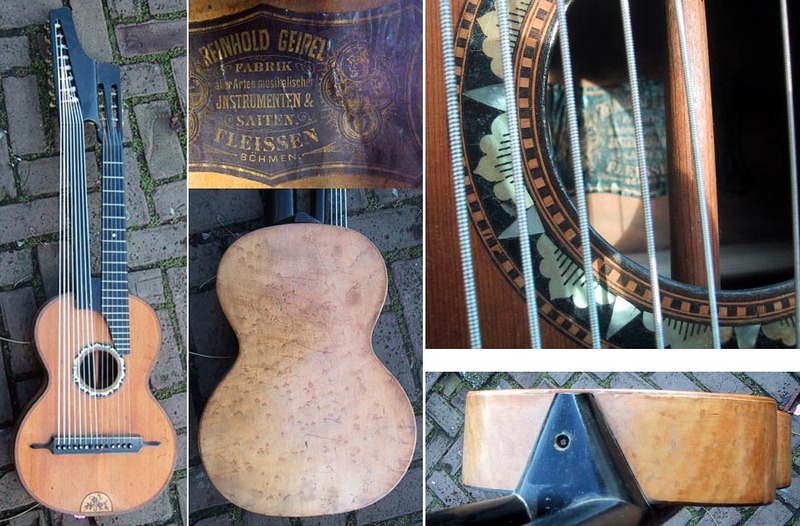 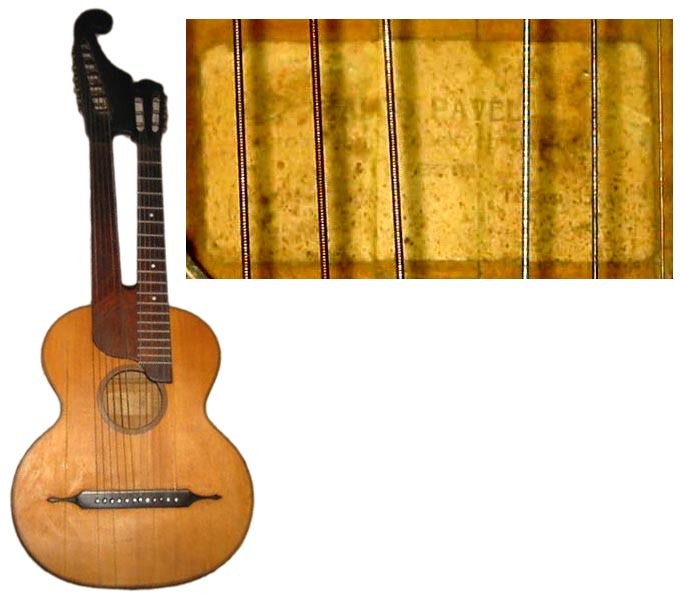 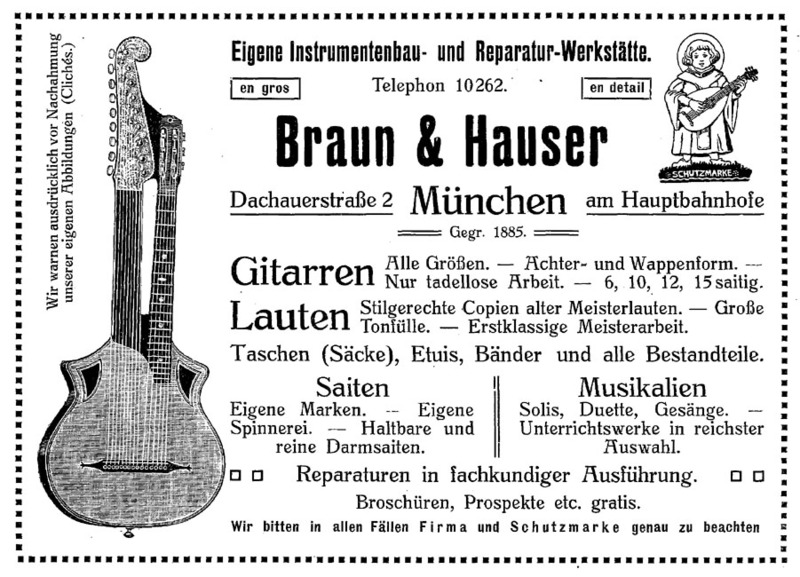 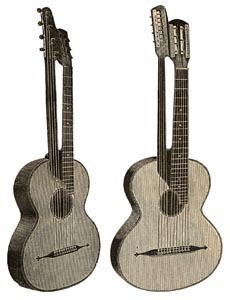 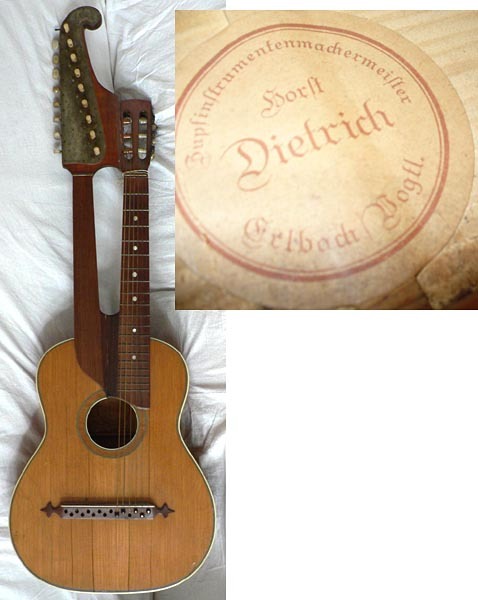 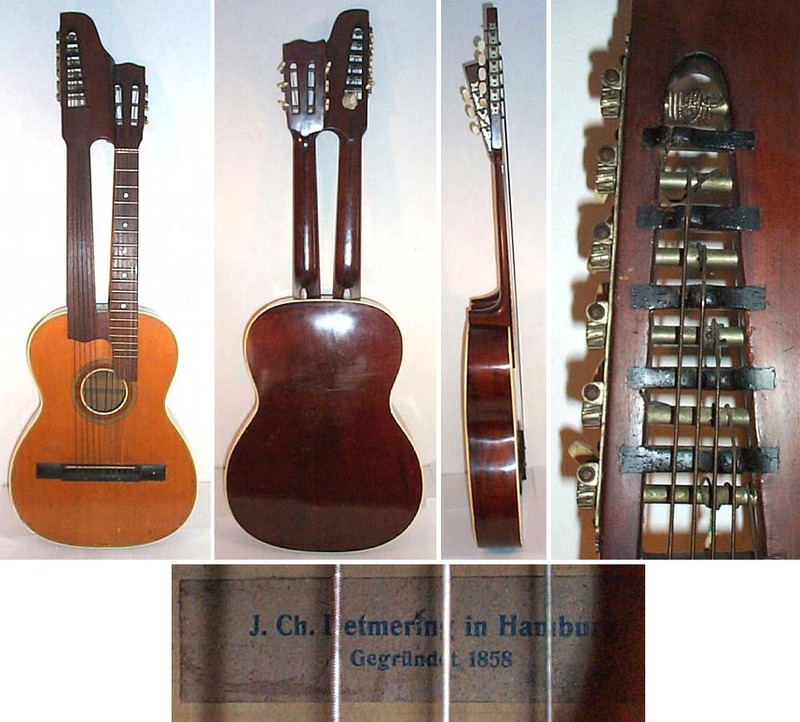 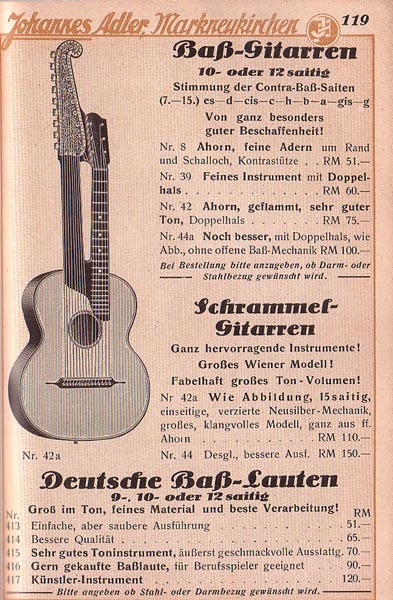 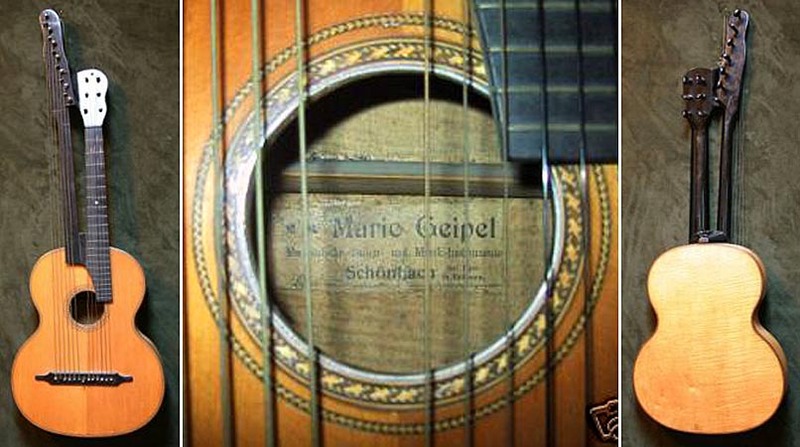 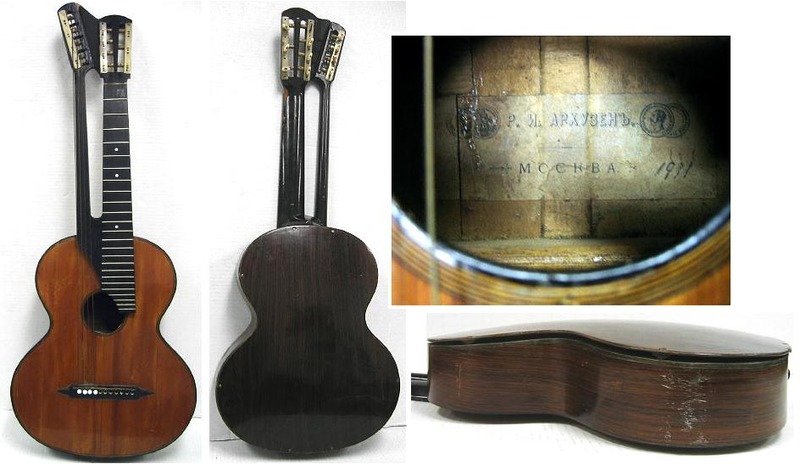 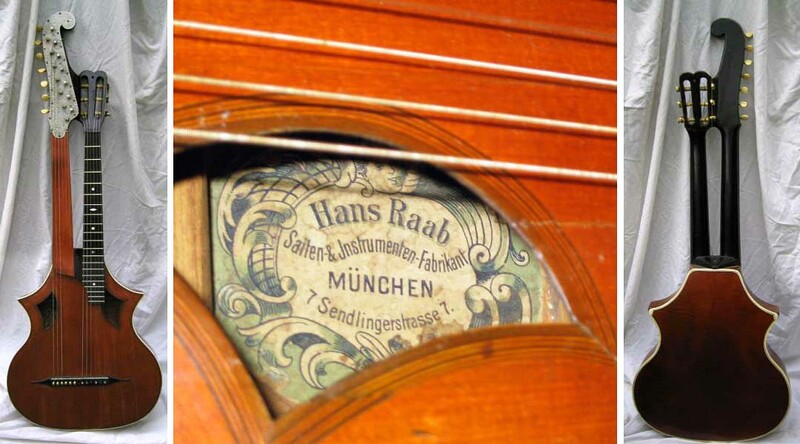 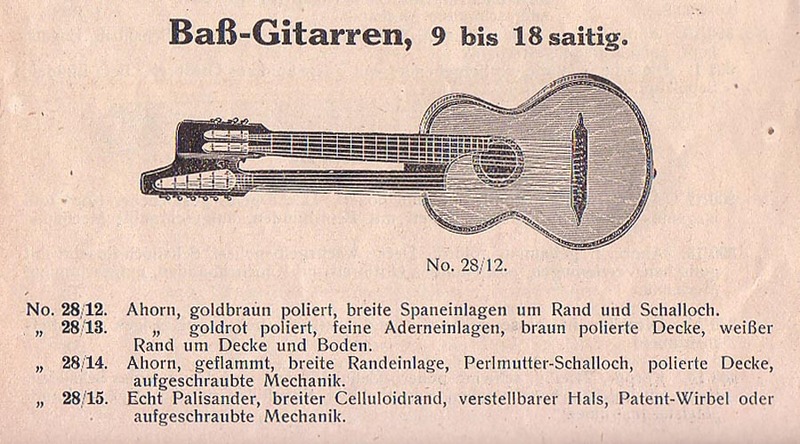 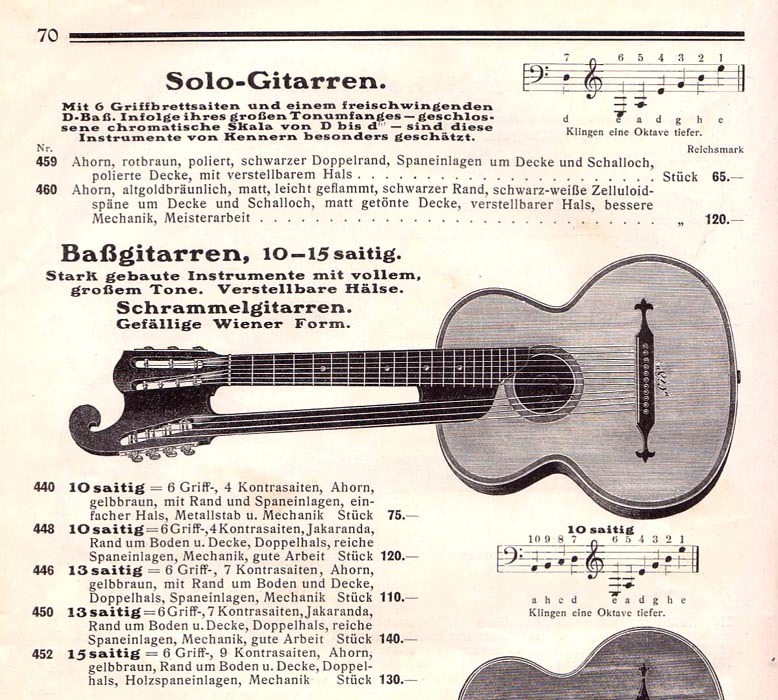 There is also a Georg Staufer terz size guitar with a second label designating restoration by Franz Nowy in the early 1900s. 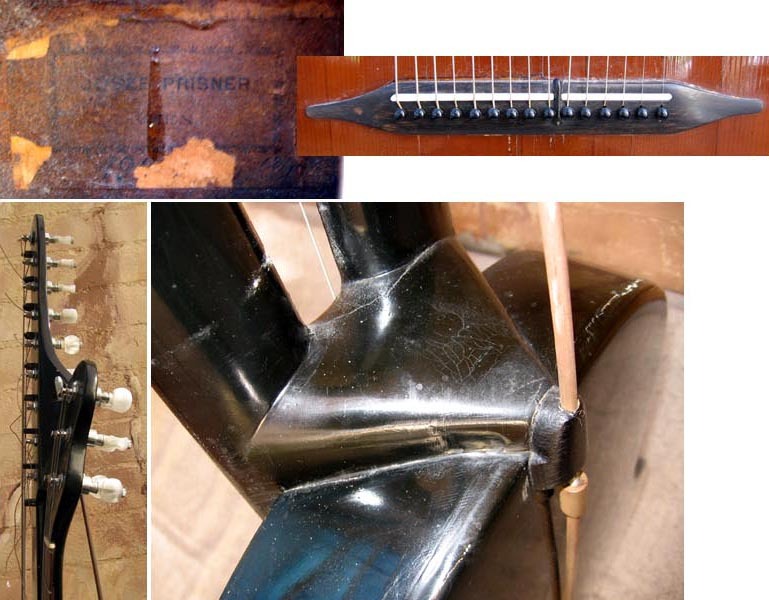 Who made these two instruments with the strange 6-on-side main tuners? 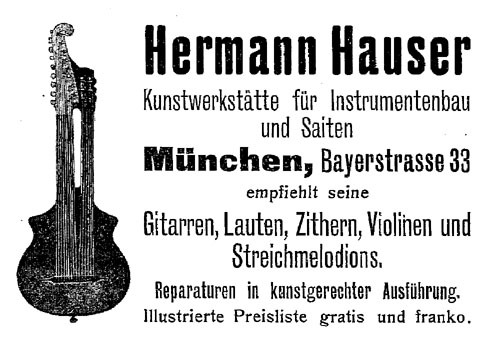 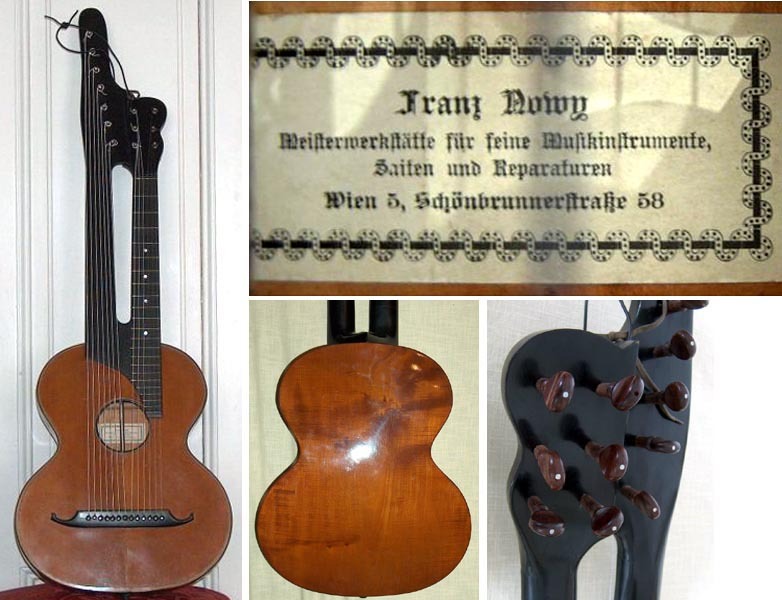 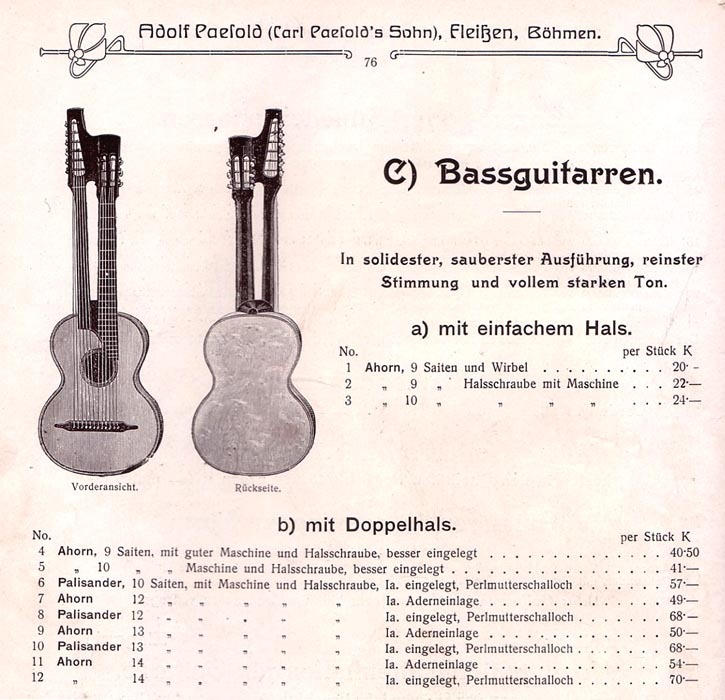 Additionally, Franz Nowy appears to have been, or become more of a factory (at least until 1950) that did many instrument repairs. 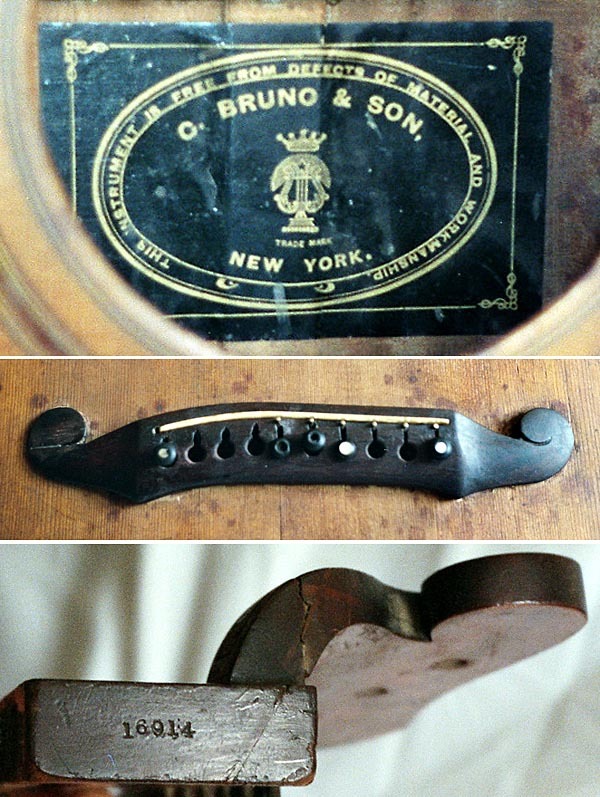 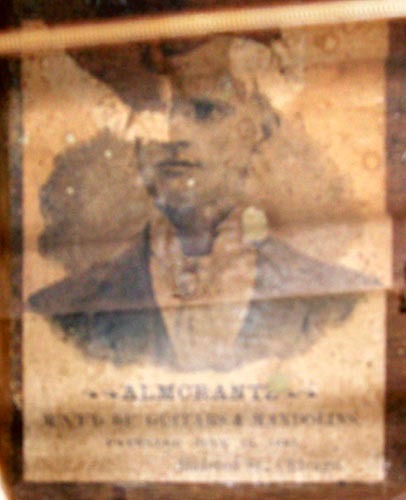 Otto F. Selling, c.1850-1875 Otto F. Selling, c.1850-1875 Signed C.H. 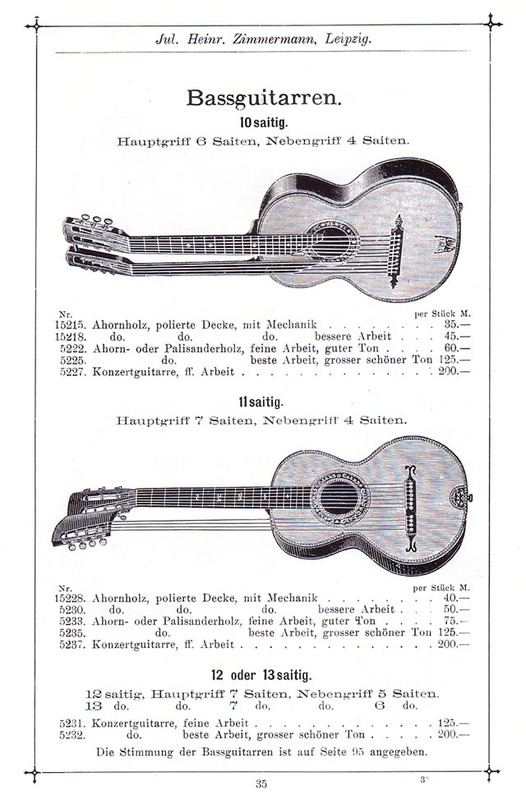 Klingberg, 1886"
Photo Reference Library of Examples.